» Forum » Restoration » Restorations documented » The Resurrection of "Possum"
» The Resurrection of "Possum"
I've read a few restoration threads here, but I think this one might have been a bit more involved than most. People who are aware of this nightmare of a project have been after me to write about it here for a while now, but I've been putting it off, as I'd likely end up writing something about the length of a novel here. 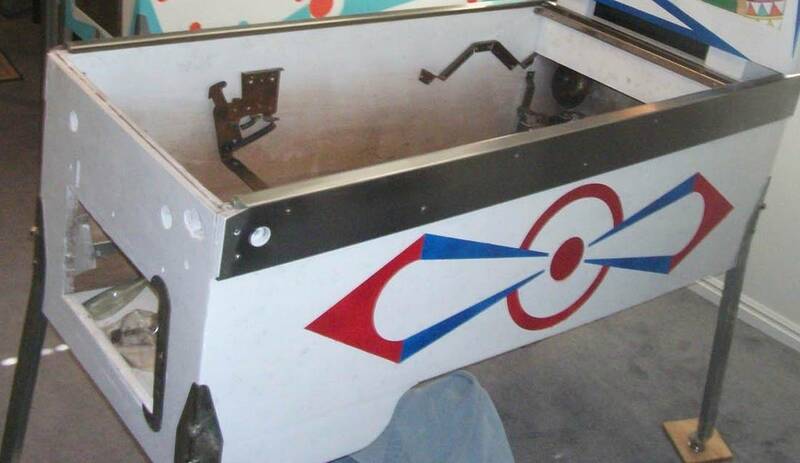 About three years ago, I received an email message from my brother Scottiedot with an attached photo of a pinball machine that was available at a local estate sale. 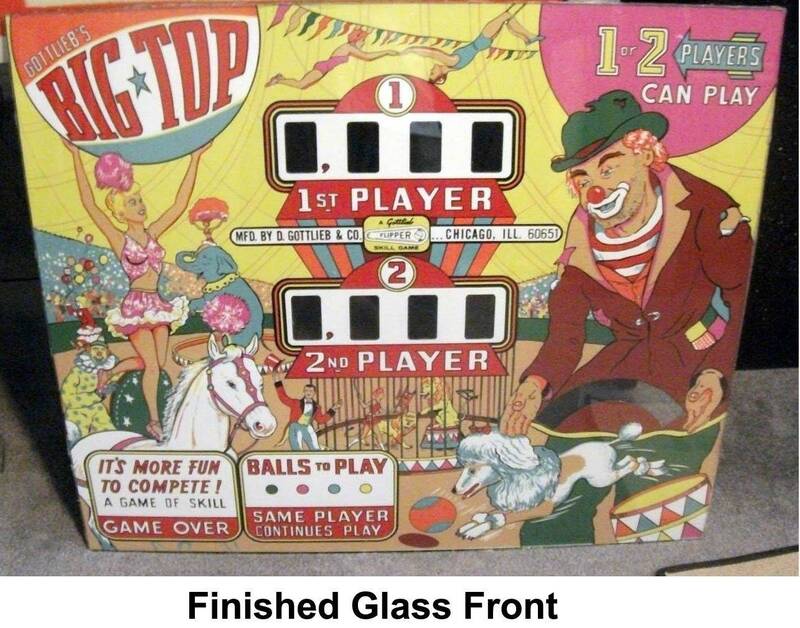 I spent about 40 minutes at IPDB, and came to the conclusion that it was a 1964 Gottlieb Big Top – a 2 player add-a-ball game. Sounded cool, so I suggested that he pick it up if it were cheap. He agreed to buy it, sight unseen, for $50. For him, the fun pretty much ended there. Backglass – About 1/3 of the paint was missing and what remained was badly faded. 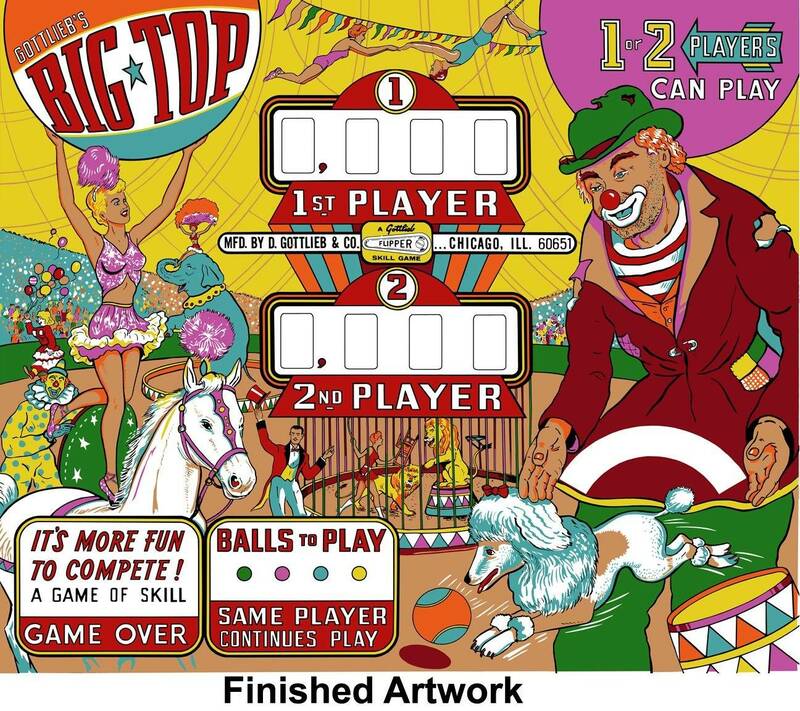 Playfield – While all of the artwork was still there, all of the color was gone. Paint would flake off if you touched it. 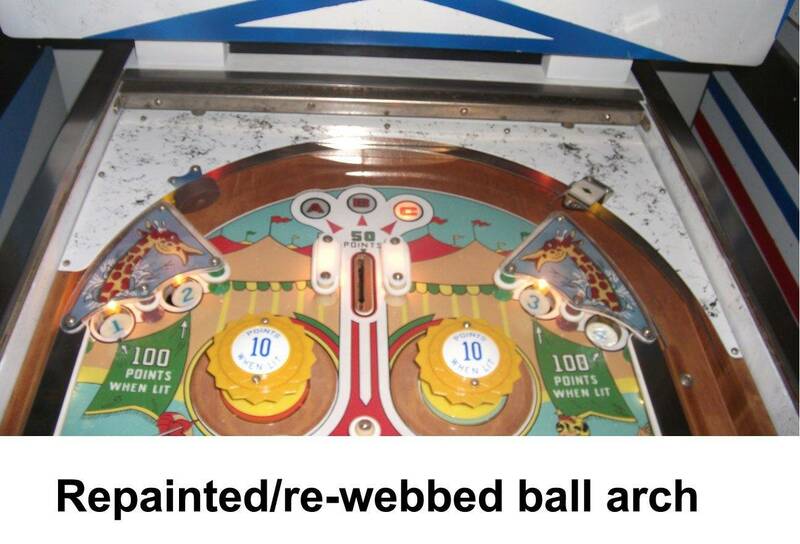 Playfield plastics were heat damaged and discolored. All 11 playfield inserts had turned brown. Pop bumpers were missing caps. The apron was rusty. 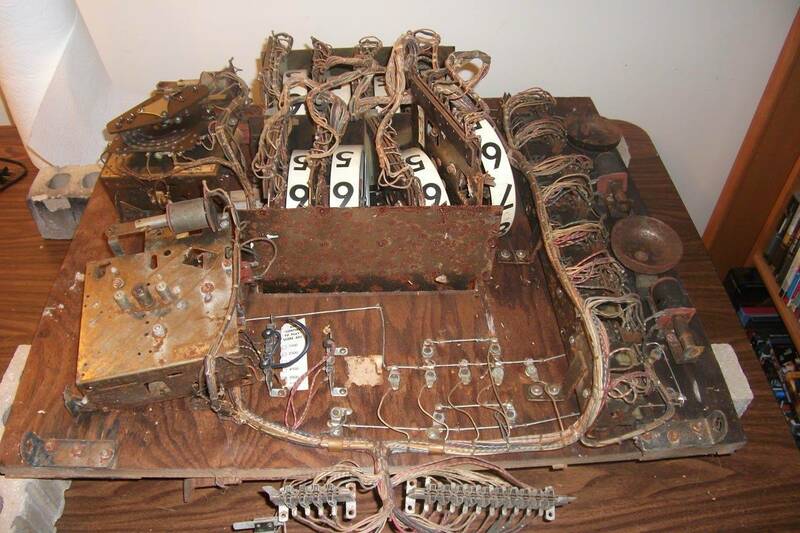 Backbox – In addition to problems with the glass, the plastic rails that hold the score reels in place had all disintegrated, leaving the reels just hanging by their wires. 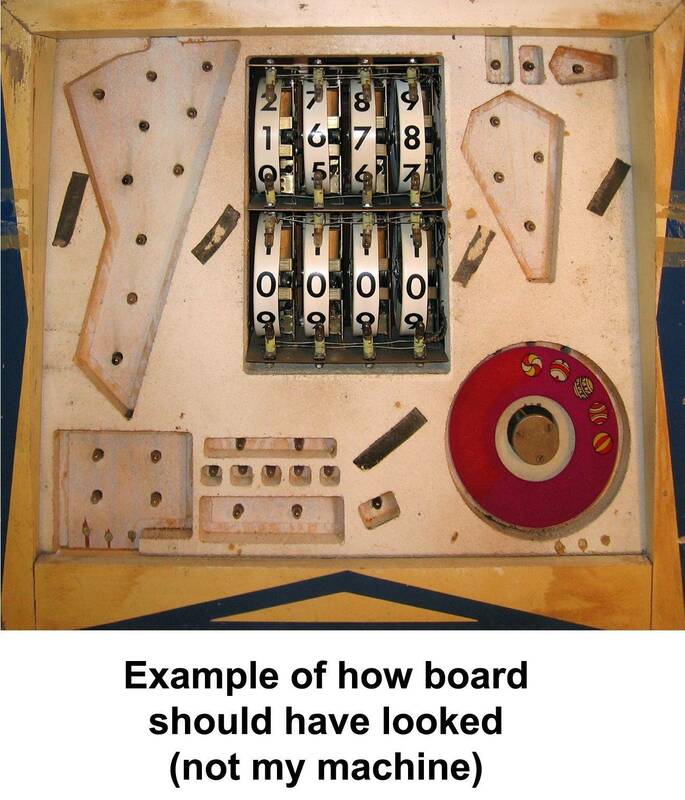 The plywood to which the score reels were mounted had badly warped, and the piece of MDF between the plywood and the backglass that surrounded the lights in the backbox had completely turned to dust. 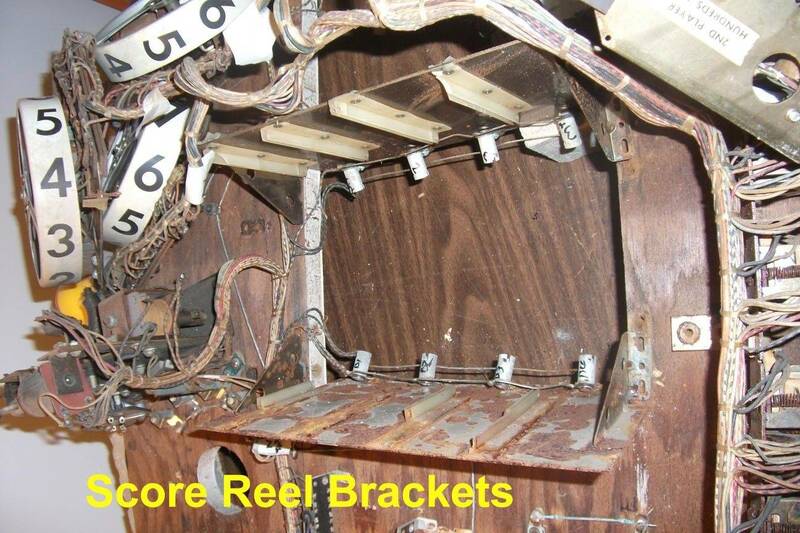 Every metal bracket inside the backbox was rusted, as were most of the steel parts on the 8 score reels. 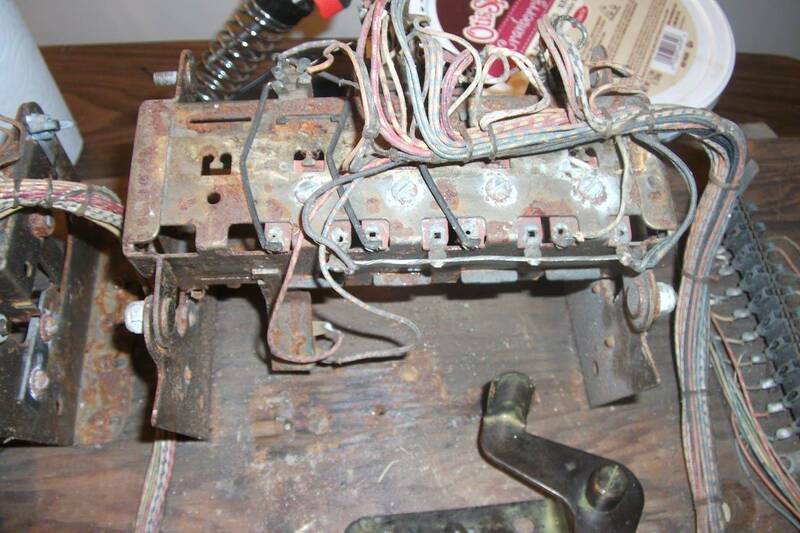 The light sockets on the playfield and backbox were so badly corroded that the bulbs couldn't be removed. 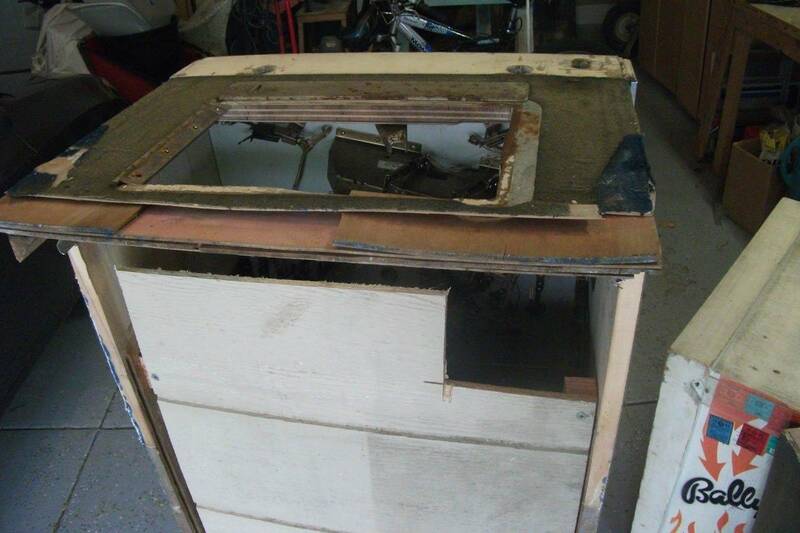 Cabinet – The coin door and coin entry plate were completely rusted. All of the chrome was gone on the lockdown bar end caps. The legs were missing. The drop down portion of the cabinet broke off and the bottom fell out. A previous owner had covered the entire cabinet in green pool table felt. Yep. Apparently, an opossum had been using the cabinet as a home. It died there, right on top of the AG relay banks. It appeared that the animal had been living in there for quite some time. Inside, the entire score motor board was saturated with urine. 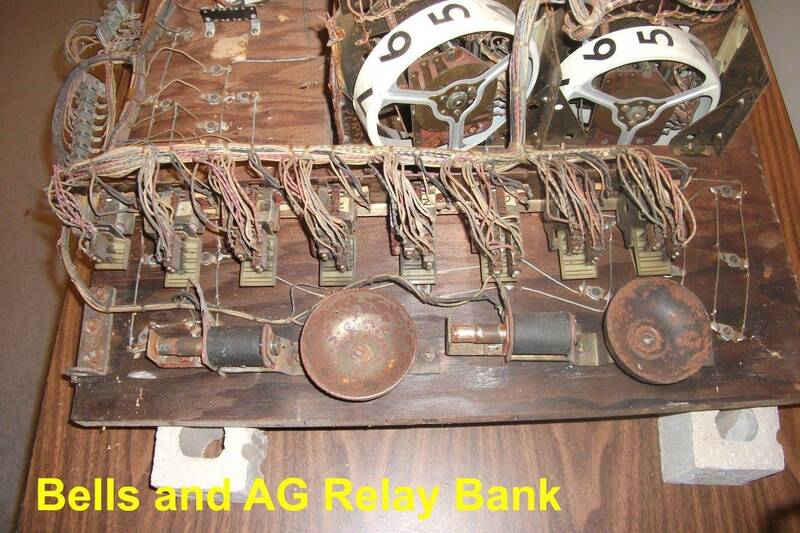 The AG relay banks were blue and crystallized. 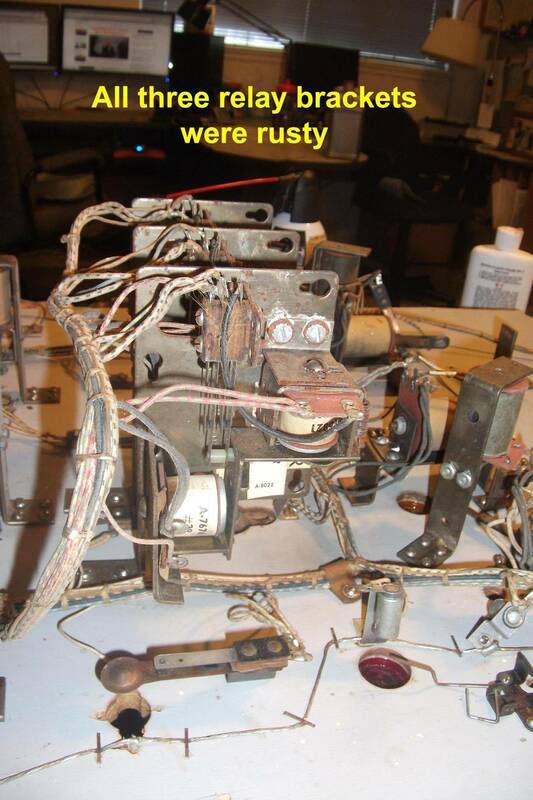 The score motor, all four relay banks, the transformer, and the tilt relay latching mechanism were rusted, as were all of the parts for the playfield latch/release. Somebody had wired up a standard wall light switch to start a game. Not surprisingly, my brother declared that doing anything with this machine was beyond either his level of interest or experience. He asked me if I wanted the game. Sometime later, while visiting, I took a look at it to decide if I could do anything with it. Had the game been a Bally Circus or a Chicago Coin Dolphin, I'd have helped him haul it to the landfill and bid it good riddance. 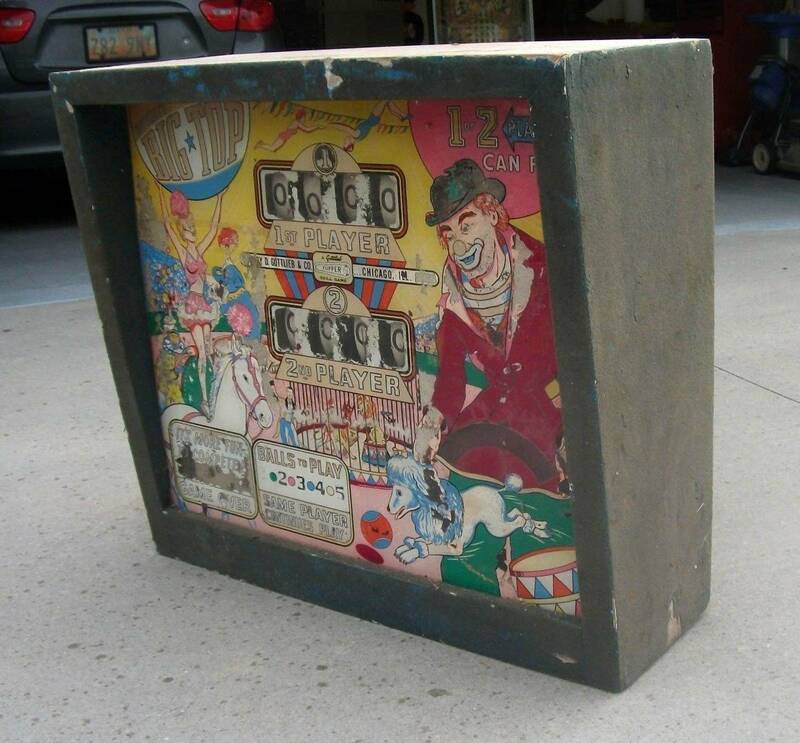 But it was a Gottlieb Big Top – one of only 10 two-player AAB games that Gottlieb made. It was their first two-player AAB, and the only one they ever made that was designed from the ground up as an AAB, rather than being a conversion of a replay machine. An interesting game and a hard one to find. I thought it might be worth trying to salvage the machine. Restoring this game would allow me to learn some new skills, and I'd have the satisfaction of knowing that if I could restore this train wreck of a game, I could likely restore anything. I live in Utah and the game was in Texas, and I wasn't yet sure that it shouldn't go to the landfill and I was reluctant to spend $400 or so to ship it to my house if all I was going to do was throw it away. 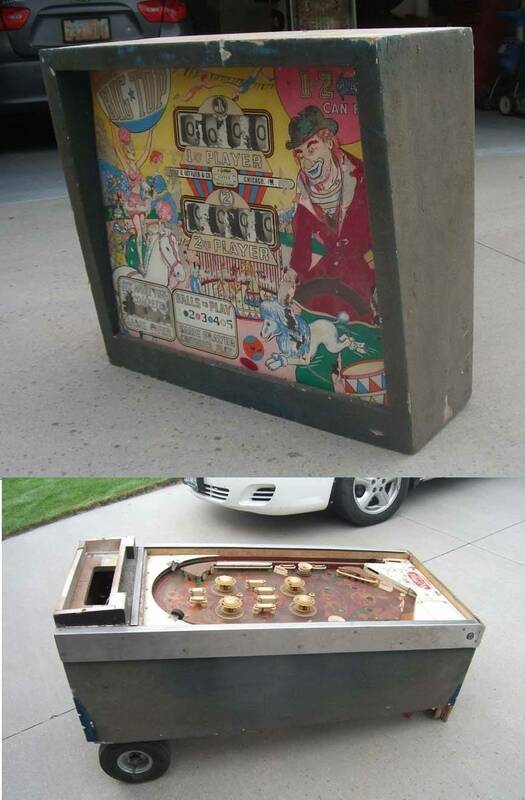 I did a huge favor for a friend of mine – I provided the labor to restore a Bally Kiss machine for him. In exchange for that, he paid to ship the game we were now calling “Possum” to my house. It sat there for nearly 6 months before I could bring myself to even touch it. I'd just stare at it every now and again, mostly trying to figure out what to do about the playfield. I had a strong urge to throw it away, but both my brother and my friend now had money invested in the game, even if I didn't. Out of respect for their investments, I thought I should attempt a restoration. I got it done, but it was a pretty ugly, time consuming, and relatively expensive project. The restoration of Possum took 20 months. essmeier last edited this post 1 year ago. Epic! Please tell us you powdercoated the bones and left them inside the machine as a warning to others. You'll get them. I'll detail each of the main areas of reconstruction shortly. Alas, Scott disposed of the bones before I took possession of the machine. Make a heck of a topper. Not much to talk about here, and I don't have a lot of photos to show off for this part. I started working on the cabinet fairly early because the work was basic and it largely didn't involve spending much money since I already had paint stripper and paint on hand. I still wasn't sure this game wasn't going to get thrown away, so I started by doing work I could do cheaply in case everything ended up at the landfill. The drop-down cabinet had the drop-down part broken off, but I still had the pieces. The cabinet bottom was discarded early on, along with the late possum that had been living there. The three slats that ran across the inside of the bottom of the cabinet to support the score motor board had all come apart and weren't usable. I replaced those, and bought a piece of plywood to replace the bottom. I wasn't so sure about the integrity of the wood, so I used metal mending plates on the inside of the cabinet to attach the drop-down part to the main cabinet. After reassembly. I stripped all of the nasty green felt off of the cabinet. It ordinarily takes about a quart of heavy-duty paint stripper to strip a cabinet clean, but this felt just acted like a sponge. I ended up using about a half a gallon. After that, I filled holes, sanded the game down with multiple grades of sandpaper, and gave it a quick coat of white primer. While this was going on, I was soaking all of the metal parts that were not part of the score motor board (playfield latch, bell and knocker assemblies, etc.) in Evapo-Rust. I ended up using three gallons of that stuff before I was done with this game. The original webbing was visible on the inside of the cabinet, and it was surprisingly light. It was some of the faintest webbing I've seen on a game. I've only done splatter in the past, so webbing was new to me. ...and that's the method I ended up using. Testor's plastic model paint, paint thinner, and Testor's black enamel paint, sprayed on with an airbrush. Works well. The artwork on this game was fairly simple, so I was able to grab some photos from various places on the Web to get an idea of what the art should look like. I also was able to get a bunch of helpful photos from Pinsider Matt Model237. I own a vinyl cutter, so I created the stencils in Photoshop, and used Sure Cuts a Lot Pro 3 to cut my stencils out of adhesive vinyl. After that, it's a basic paint job. As I was going to end up replacing pretty much everything on the game, I opted to use pure white rather than off white. A lot of Gottlieb paint colors match well with Krylon spray paint, so I just went that way for the white, the red and the blue. While I had the side rails off, I sanded them down with #80, #200, #400, #600, #800 and #1000 sandpaper and then polished them up with some Mother's metal polish. They came out fairly shiny when I was done. The paint job came out well enough, and after that, winter was setting in. I decided to concentrate on work that I could do indoors. That meant working on the backglass and doing ...something... with the playfield. 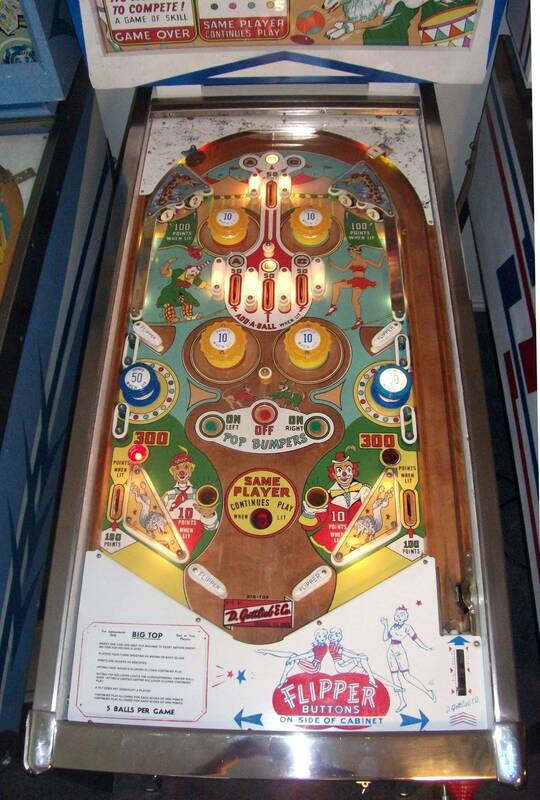 If there's one thing about this game that gave me pause regarding restoration, it was the playfield. 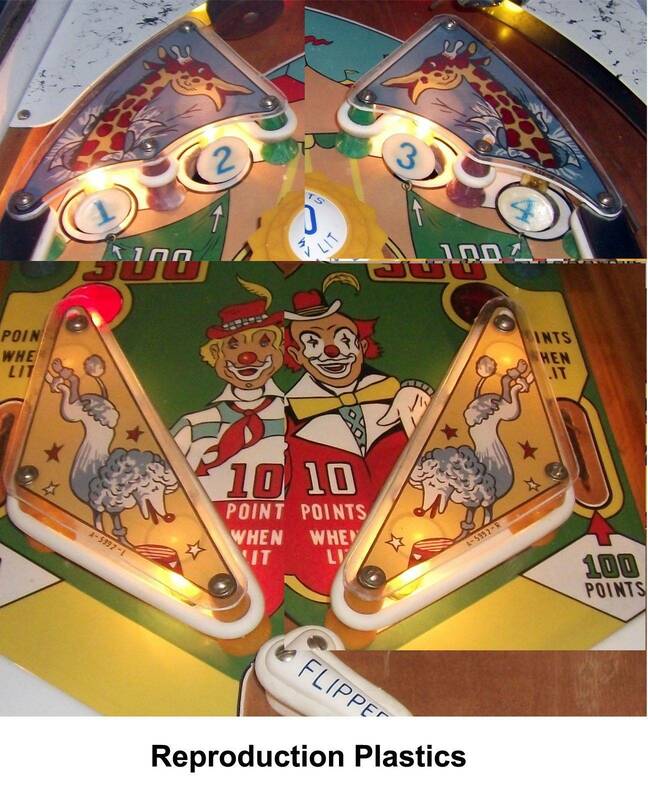 I usually give the condition of the playfield a lot of weight when I'm buying a game because I hate touching up paint and I'm not all that good at matching colors. 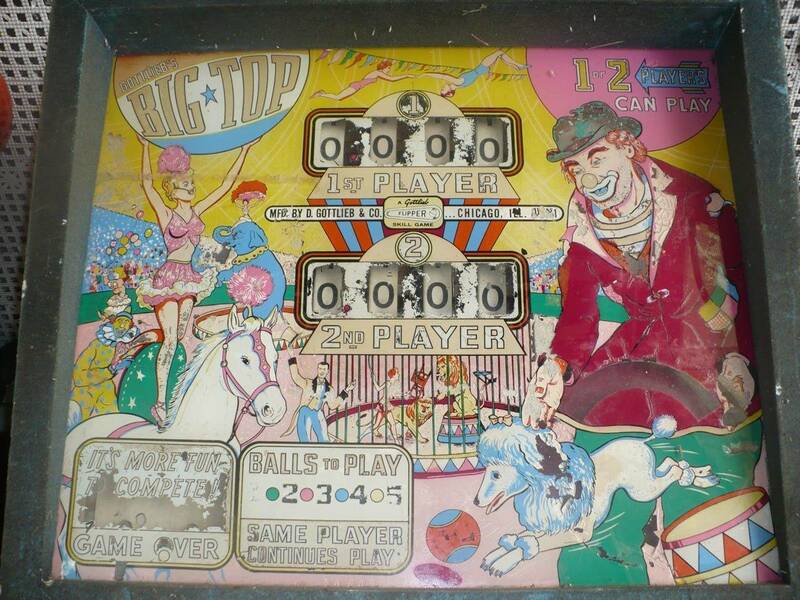 In this case, the playfield was completely shot, yet the artwork was all still there. 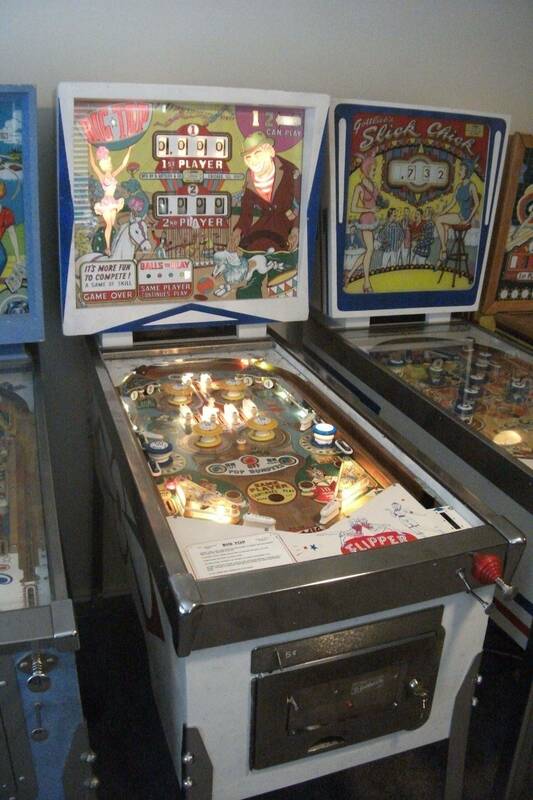 That's not bad lighting in the original photo; that's exactly how the playfield looked. It was all brown, with all of the color gone from the artwork. 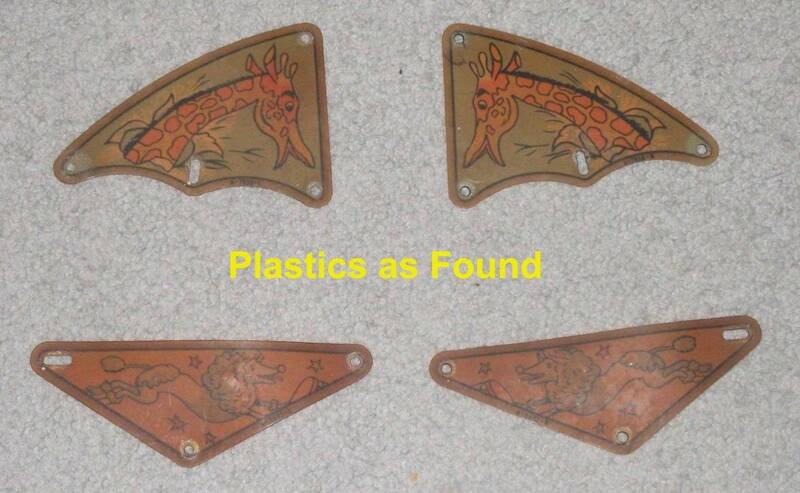 All of the inserts had turned brown, as had the plastics. “Touching up” wasn't an option here. I suppose I could have just clear coated the whole thing and called it a day, but it would have looked awful. This was originally a very colorful game and having an all-brown playfield wasn't a solution. As four-color silkscreening isn't really cost-effective for a one-off project, I decided to go with a vinyl overlay. 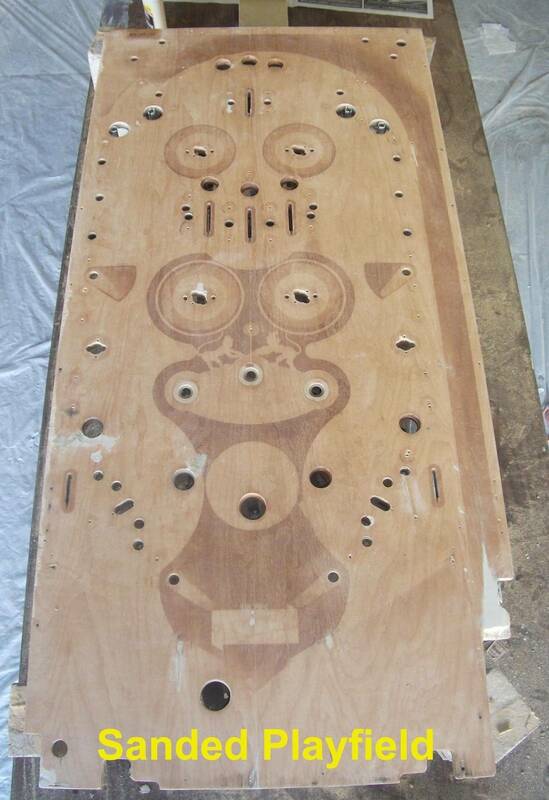 The first step was stripping the playfield of everything so I could get down to just the wood. Once I did that, I scanned the playfield with a flatbed scanner. The scanner I had at the time could only do 8 1/2” x 11”, so it took about 20 passes to scan the entire playfield, scanning at 600 dpi. After that, I used Photoshop to clean up the art. Newer versions of Photoshop have a nice feature that allows you to assemble multiple images into a single composite image. As long as every scan slightly overlaps the ones next to it, Photoshop can figure out where everything goes, adjust the color appropriately, and then eliminate all of the seams. This part was easy. Load up all 20 images, tell it to go, and get out of the way. The final assembled image was a couple of gigabytes in size, but it actually got smaller as I cleaned up the artwork. Color matching is hard to do, but I grabbed photos at the IPDB and the Alamo Games site and made my best guess regarding what the colors should look like. 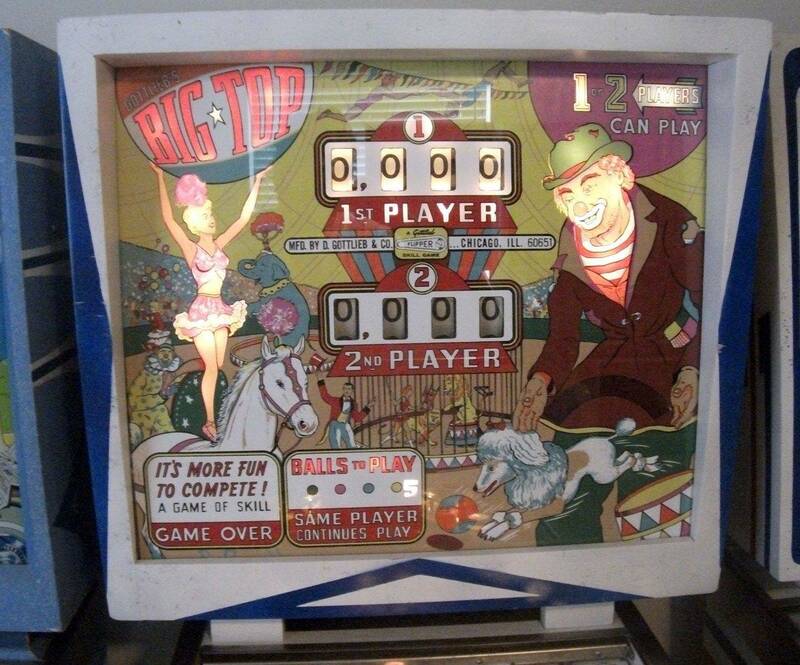 As this machine isn't ever likely to find itself sitting next to another Big Top with a factory playfield, matching the colors exactly wasn't vital. Close enough would do. I spent 40-50 hours cleaning up the artwork in Photoshop, slowly replacing brown areas with correctly-colored ones. The hardest part was adjusting for slight sizing errors in the scans and making sure that the finished art was pretty close to the right size. 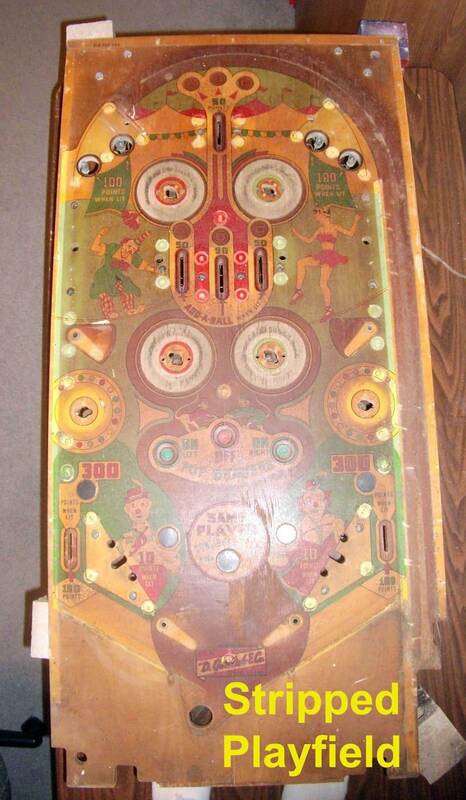 This playfield has 11 playfield inserts and multiple rollovers, so the artwork has to line up correctly. Cleaning up the artwork was relatively easy, if tedious. The hard part was getting it to look right on the wood. It's hard to find a print shop that can print white; you usually need to use white media if you need a white finished product. 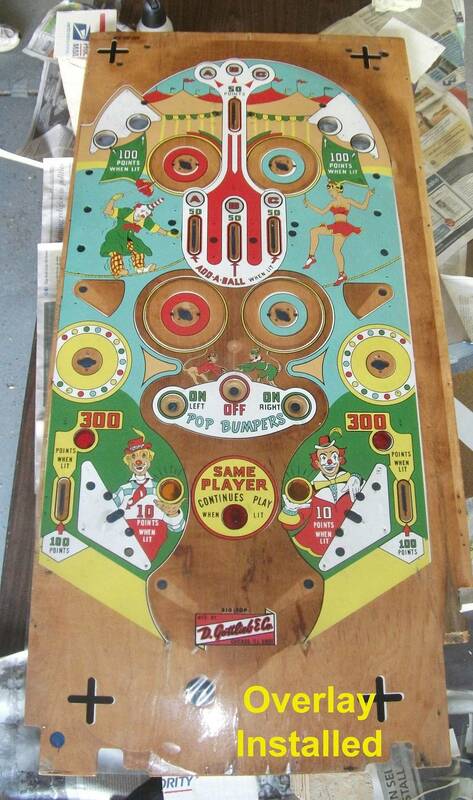 Quite a bit of the playfield on this game consists of bare wood, while other parts of the artwork were white. 1. Print the overlay on white media and cut away the parts that needed to expose bare wood. 2. 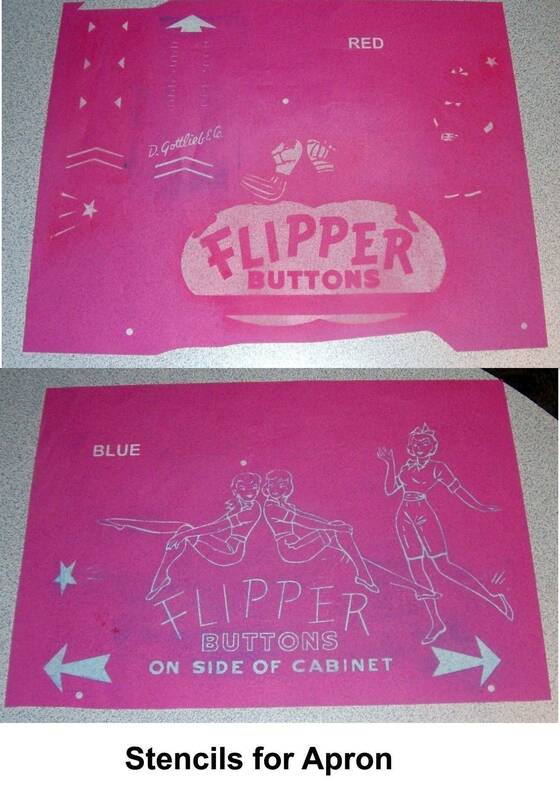 Print on clear media and put white paint underneath it. 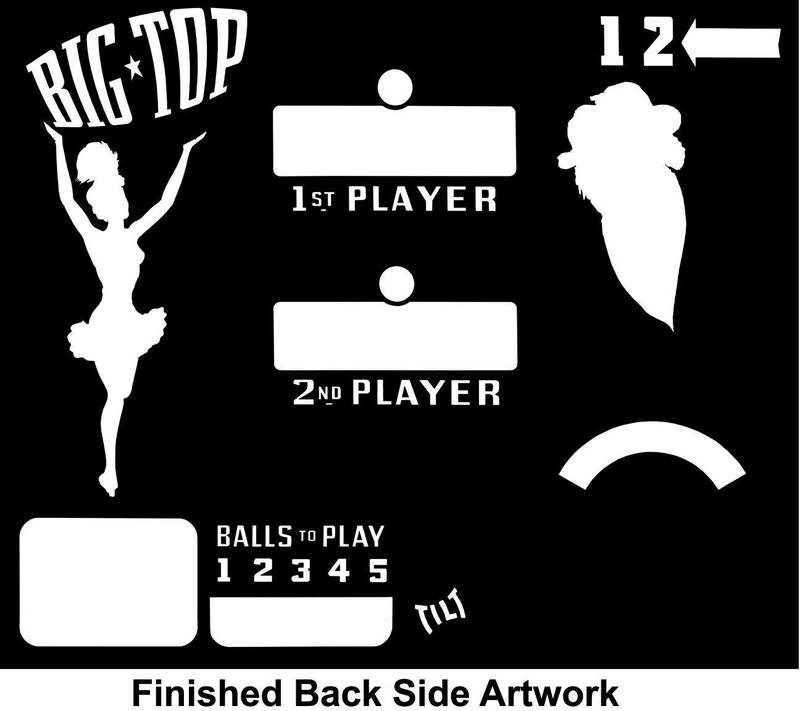 I opted for #2, as I wanted a uniform surface on the playfield. Using my finished artwork as a guide, I created a stencil that would allow me to put white paint on the playfield only in places where artwork needed to appear. Everywhere else would be left bare wood. 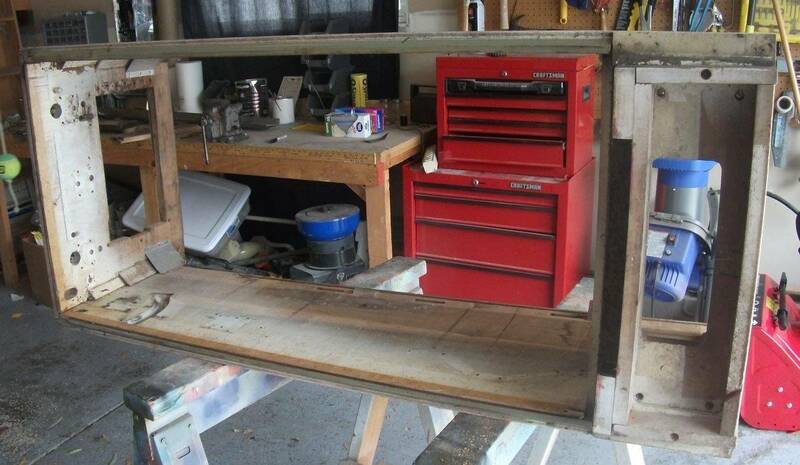 Then I would put the overlay on top of the partially painted wood. If everything lined up correctly, the white paint would show through the clear parts of the artwork where appropriate. I also thought having a white base underneath the colored parts of the playfield art would add a bit more “pop” to the color. 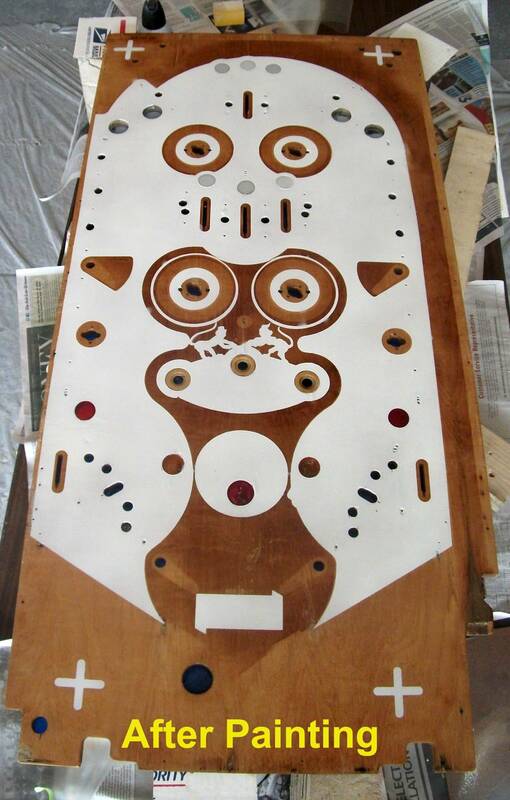 After that, I sanded the playfield bare, sanding it with #80, #200, #400, and #600 sandpaper to get it smooth. I also had to fill in a few cracks and divots. I cut the stencils for the white paint using my vinyl cutter. My vinyl cutter also works as a plotter, so I could first use it to draw the artwork on paper using a pen where the blade would ordinarily go. This let me check to make sure that the artwork was sized correctly. I had to make a few adjustments in size before I got the stencil ready to go. 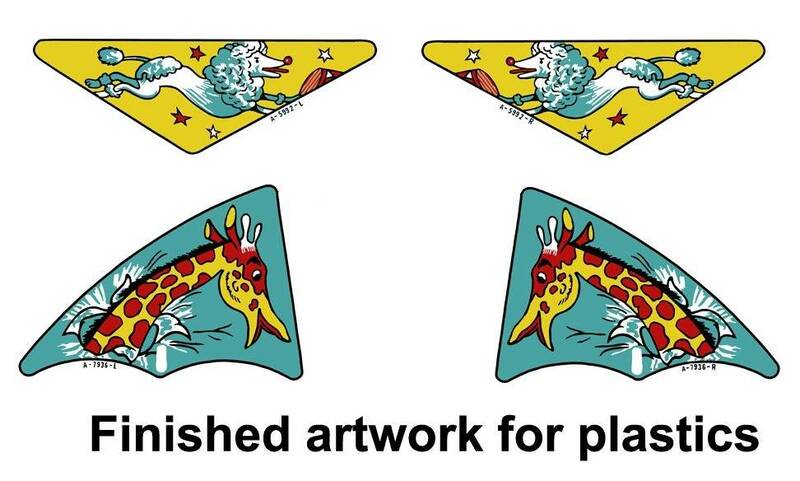 Once I did that, I also had to make corresponding size adjustments to the finished playfield artwork. I had a local Alphagraphics print the artwork on clear adhesive vinyl. 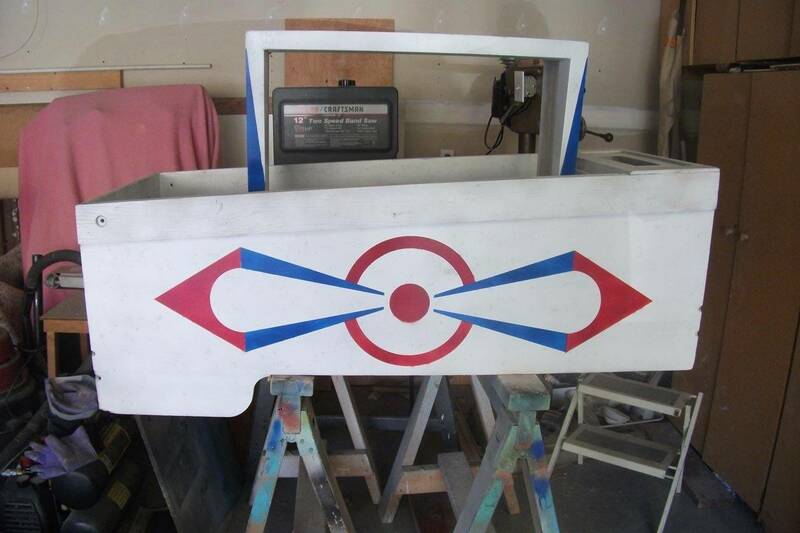 I used the stencils to put spray white paint on the playfield. 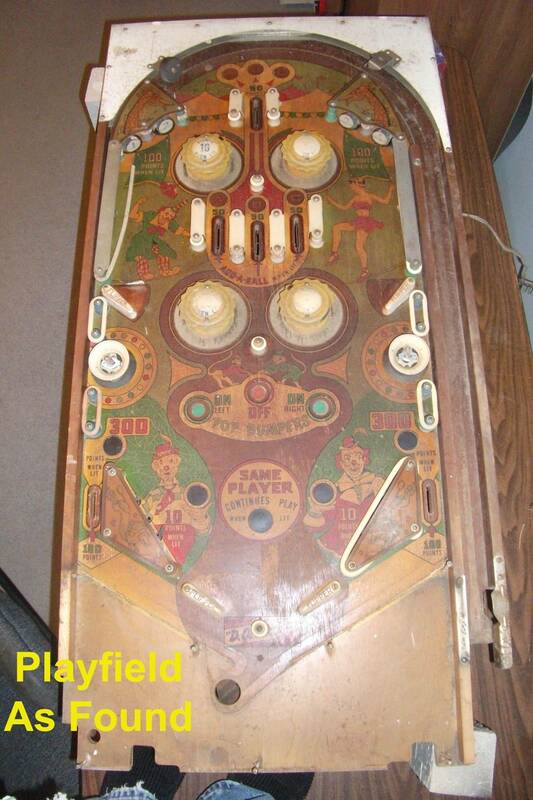 After that, I replaced all of the playfield inserts with new ones. After the artwork came back from the printer, I got some soapy water and a squeegee and with the help of my wife, we applied the playfield art. It didn't quite line up, so we had to make a couple of attempts to get it right. There are a few spots where a bit of white shows up outside of the edges of the artwork, but I figured that once the playfield was populated, these spots wouldn't draw attention to themselves. I squeegeed out the air bubbles and then I let it sit for a few days. 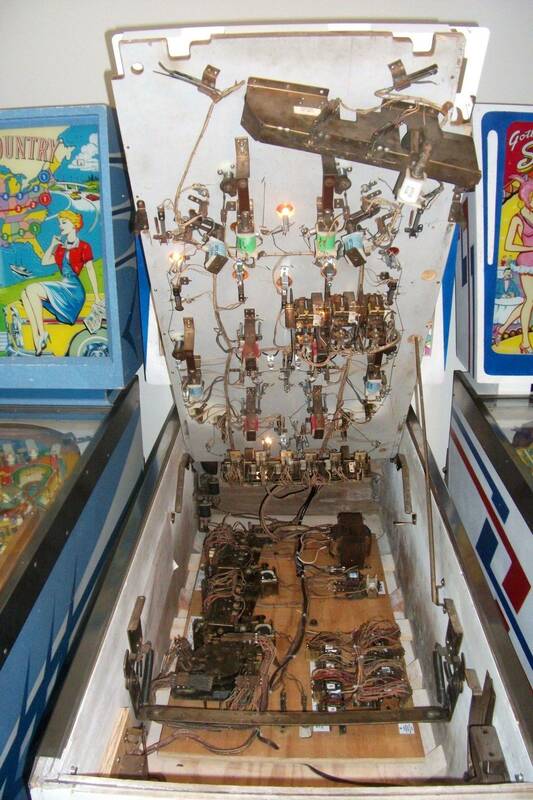 After that, I cut out holes for the pop bumpers, lamps, rollovers and playfield inserts. Then I applied about 6 coats of polyurethane. I also didn't want to buy $400 worth of respiration gear to clear coat a playfield. Polyurethane it is. I did a light sanding after each coat, and then let the thing sit for six months while I worked on other, more troubling parts of the machine. At the same time Charlie was busy resurrecting "Possum", I was restoring my own Big Top, purchased 2015 off CL for $160. I thought mine was in rough shape, but Charlie's here takes the cake, by a long shot. It's been great having someone else restoring the same machine at the same time. We've helped each other along the way, with advice, digital files and the odd part flowing my way more often than not. Not sure I would have succeeded without Charlie's generous input! I forgot this pin originated in Houston. So along with mine and two other Dallas examples I know of, a total of four Big Tops have recently appeared in Texas. Which has me wondering if Texas was an Add-a-Ball state in the mid-to-late '60s. Anyone know? And was that toasted playfield solely the result of repeated exposures to Houston summer heat? I can't believe how brown and faded it got! Or was there something else at work? I, too, have wondered about all of the Big Tops that seem to be turning up in Texas. I don't recall ever playing an AAB games while growing up in Texas, so I don't know why they're turning up down there. This one had clearly been there a long time. Matt was a huge help in this project, mostly because he was able to take a picture of this or that when I needed one. He also helped identifying parts, as my game was missing labels on nearly every relay. That became a huge problem later on. The backglass was a mess, with lots of missing paint and a lot of fading. Nobody is making a reproduction on this one, and I have no experience with the likes of BGResto, so I went the DIY route. 1. Print artwork on glossy photo paper and cut holes where appropriate. 2. Place in between two 1/8” thick pieces of glass. 3. Mask off areas that should not pass light. 4. Seal edges with silicone. There are various ways to do that, and they all work pretty well. As with the playfield, I scanned the glass; it took a dozen scans. I used Photoshop to assemble them into a single composite piece of art. I then spent 60-70 hours reconstructing the artwork. I spent more time on this than any other single aspect of the game as there's a lot of detail in this particular backglass. For the parts where the glass was missing paint, I tracked down several other Big Top owners who were kind enough to send some high quality photos. I just worked on it over a period of a month or two when I had spare time or when I needed a break from real work. Then I had the artwork printed at Alphagraphics on photo paper and cut out the holes for the score reels and for the extra ball counter. For the masking, I took a different approach from previous projects. I created artwork for the masked portion of the glass and cut a stencil on my vinyl cutter. 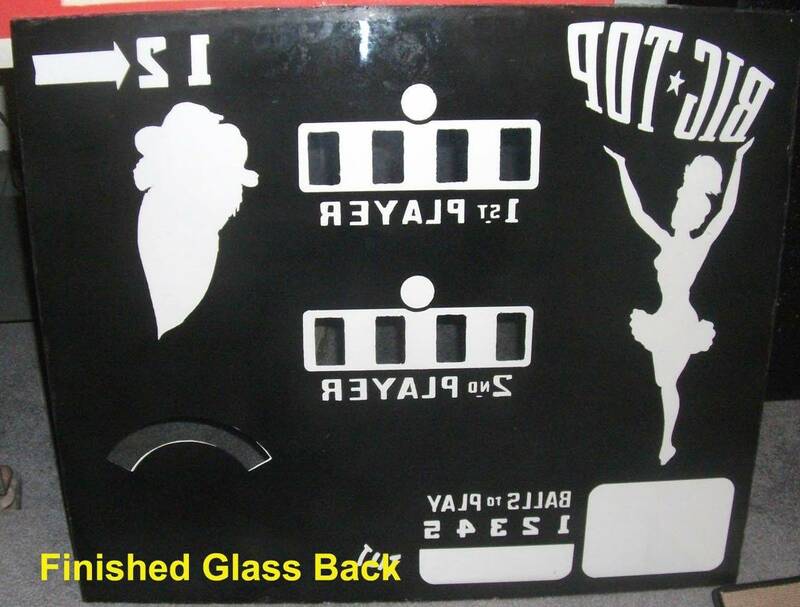 I used the artwork for the front of the backglass as the basis for the stencil, so there would be no alignment issues. Then I applied the stencil to a piece of glass and sprayed it with dark primer. I pulled the stencil off and let the paint dry. Then I laid the artwork on top of it and put the second sheet of glass on top of that. Then I sealed the edges with silicone. All done, and the finished glass came out great. Playfield plastics are fairly easy to reproduce, fortunately. The four plastics that came with Possum were warped and all brown. 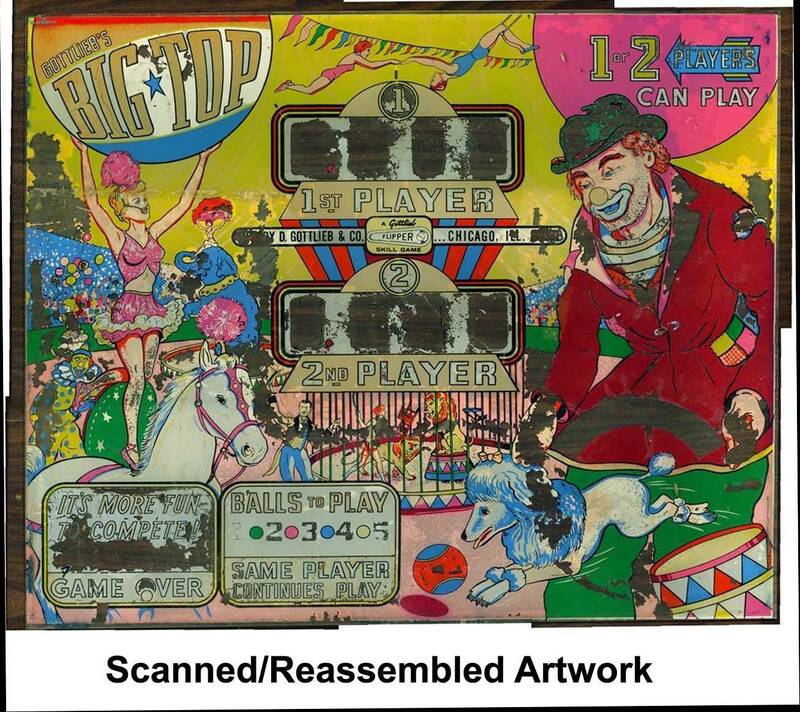 As with the playfield and backglass, you start by scanning what you have and cleaning up the artwork. Print it out in reverse on clear adhesive vinyl. Attach it to a piece of Lexan. Cut it to shape and drill holes where appropriate. Mask off the edges (which should be clear) and spray the back side of the plastics with white primer. Peel off the protective covering on the Lexan. I wasn't sure what to do about the playfield apron. It was rusty, but all of the artwork was there. I soaked it in rust remover and while it got all of the rust off, the end result was a badly yellowed and scratched up apron. That's fine for simply “fixing” a game, but at this point, I was essentially rebuilding Possum from the ground up. If I stuck with the original, now-rust-free apron, it would stick out like a sore thumb on the finished game. While I understand the viewpoint of keeping things as original as possible when possible, I didn't see a way that keeping the original apron intact wasn't going to look awful. I opted to strip it and repaint it. For repainting, I used Rustoleum white appliance epoxy. It gives a pretty nice finish. For the artwork, I had to scan it, clean it up in Photoshop, and separate the blue artwork from the red. Then I created stencils using light-sensitive screens from craftyprinters.com, I've used those from EZScreenPrint.com, too, and they both work well, after you get past the “how long to I expose this to light?” learning curve. Jacquard makes silkscreening inks that work well on metal, so I bought some in red and some in blue. Then I screened the red on one day, let it dry overnight, and added the blue the following day. While these screens are not designed for multi-color work, they can do the job if you are patient. If it doesn't work out, you just wipe the ink off with a damp cloth, dry the apron, and try it again. You can also clean up minor errors with a toothpick to wipe away small bits of stray paint. 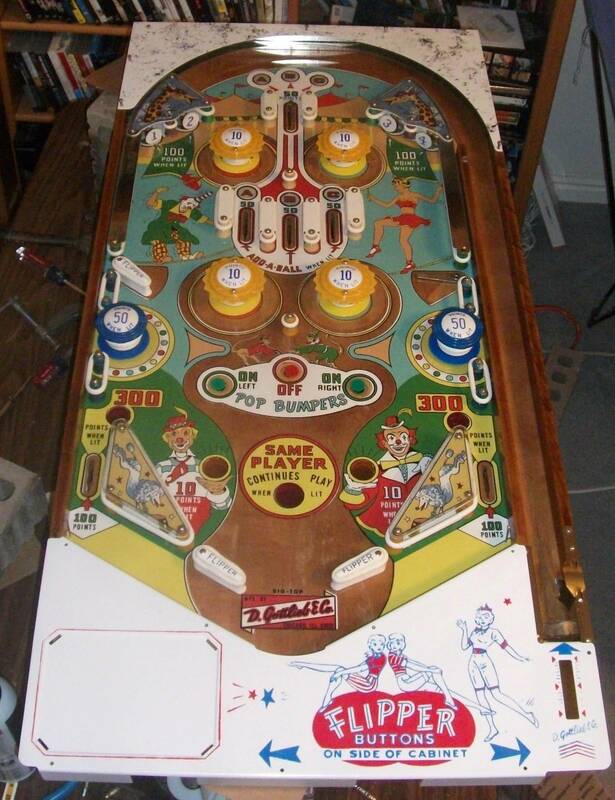 At this point, I had a repainted cabinet, a new backglass, a pretty, unpopulated playfield, new playfield plastics and a new apron. You'll notice that up until now, I haven't touched any of the parts of this game that are truly unpleasant – you know – all the stuff that actually makes the game do something. That part comes next. In fact, the next part was the most unpleasant part of the entire restoration of Possum. This thread shows why humans rule the world. Impressed by your commitment to bringing this game back to life. 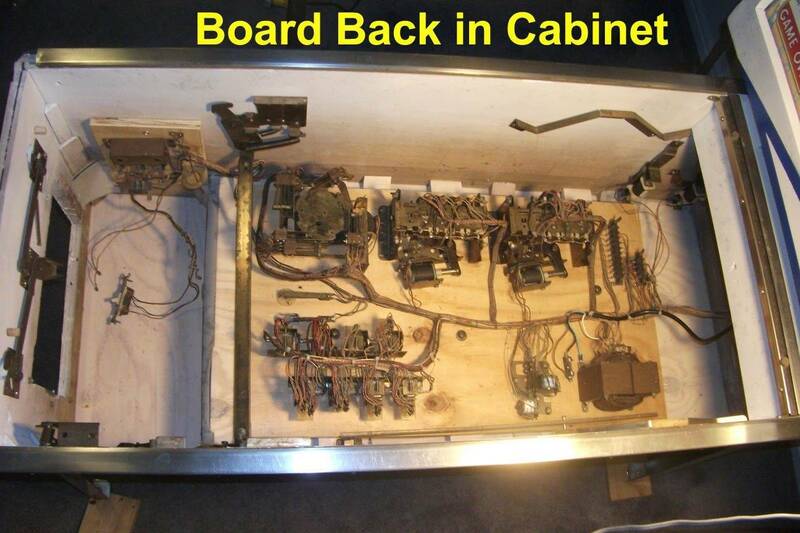 When I first started working on the cabinet, I took the score motor board out and set it aside for later. I really didn't want to work on it – ever. This was, without a doubt, the nastiest part of the project and the one I was the least eager to tackle. This part of the project was ugly, smelly, and time-consuming. This part took several weeks, and it was about a month before everything was clean enough that I was willing to touch it without wearing gloves. Because this game was really messed up, I decided early on to approach every problem as a single problem, rather than looking at the game as a whole as One Big Thing to Fix. Look at something, fix it, and move on to the next thing. That serial approach made the restoration manageable. “Hmm. This thing is rusty. I should fix that.” After that, you move on to the next problem, of which there was no shortage. The possum had been living and had gone on to his reward on top of the two AG relay banks. They were blue with crystallized urine, the screws and relay frames and armatures were rusty, and a number of wires had come loose. In fact, in working on this game, I probably encountered 30-40 cold solder joints, where the wire and solder had just pulled loose from the contacts. The transformer was rusty, which I didn't care about. 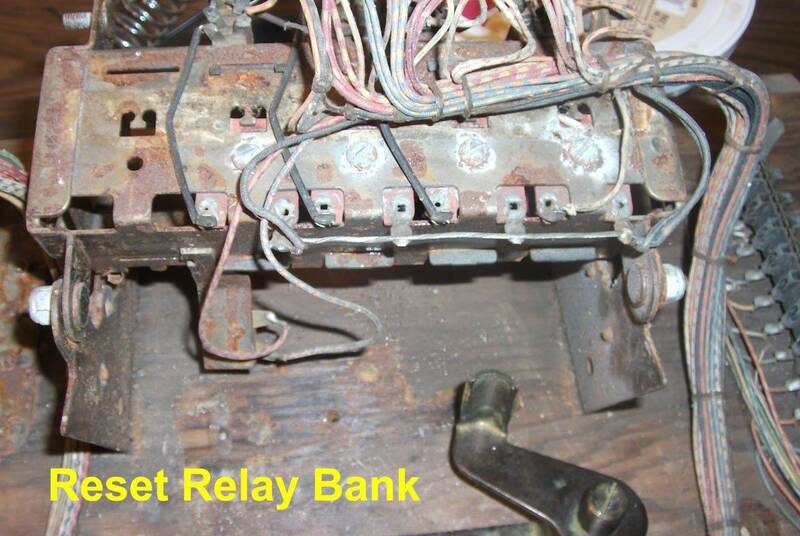 What I did care about was everything else, and it was all rusty – tilt latching relays, both AG relay banks, both resettable relay banks and the score motor frame. The board itself was also an issue, as it was saturated with possum (ahem) essence, and as it was winter, I needed to work on this part of the game indoors. That meant that the board had to go first as the smell was both unpleasant and overwhelming. I wore a particle mask and rubber gloves for this part of the project due to the nasty nature of the board and the fact that I did not know this opossum personally, nor did I know where he/she had been. 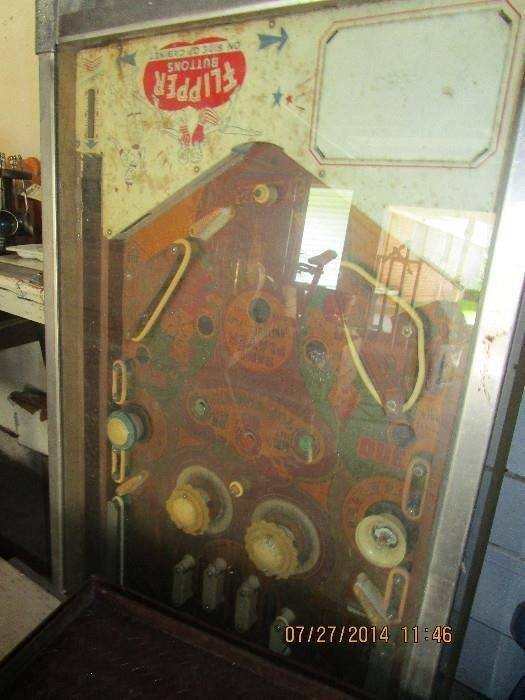 I really just didn't want to touch any of this, but there was no restoring this machine without addressing this score motor board. Armed with gloves and a mask, the first thing I did was measure the board and cut a new one out of plywood. Then I unscrewed all of the components, and pulled the old board out. I sat it on top of the new one and drilled through all of the existing holes and used a pencil to trace out the hole for the slam switch. Then I transferred everything to the new board and threw the old one away. 4. Throw parts in a container of Evapo-Rust. 5. Let sit for 24 hours. 6. Rinse and clean de-rusted parts. 7. Contact Matt Model237 when I realize I haven't taken enough pictures. The AG relay banks where the possum had been living where the hardest part of this, as the switches were blue and crystallized. I cleaned them with an old toothbrush and a mixture of water and vinegar. With a bit of patience and effort, I was able to get them pretty clean. Everything else came off in the Evapo-Rust bath. 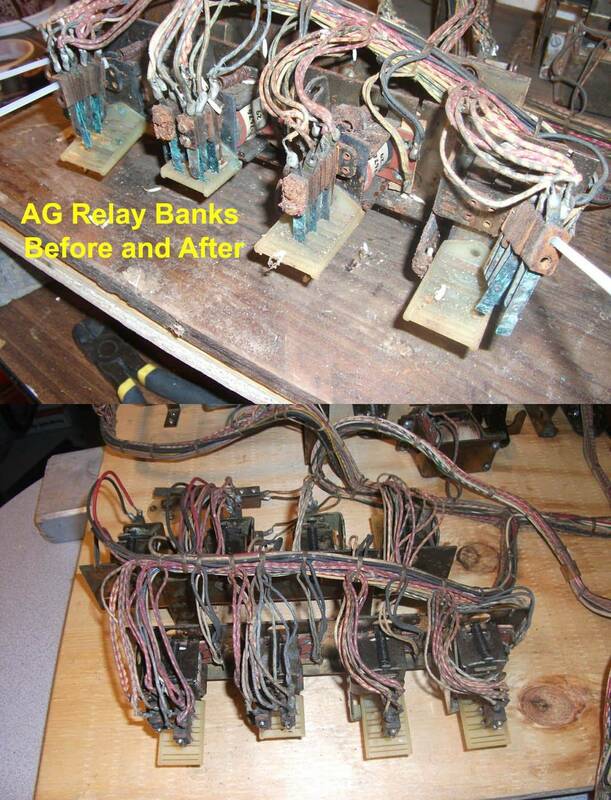 Oddly enough, when all was said and done, the AG relay banks were the least of my troubles in getting the game to work. 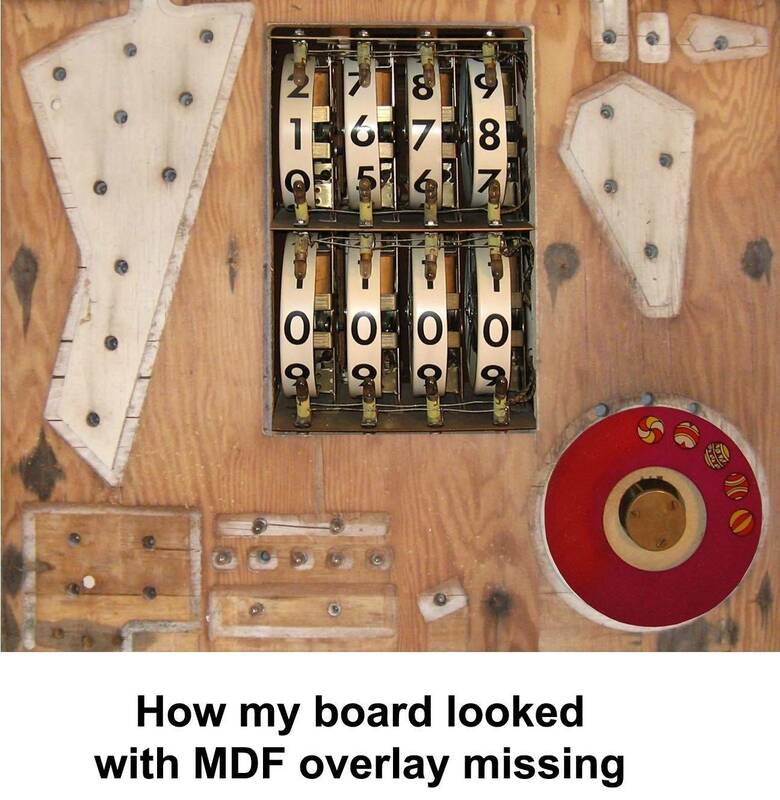 Due to rusting issues and possum urine, I decided early on that I was going to replace all 18 coils on the score motor board, as they were contaminated and many were soaked in urine. I also opted to replace all of the springs on the relays, as all were rusty and a few were broken. Before the game was done, I extended those decisions to the entire game, and I ended up replacing every coil (63 of them!) and every spring. I usually just replace the flipper coils and pop bumper coils and any others that are causing trouble, but the circumstances were different this time. It added a lot to the restoration cost, but new coils mean fewer problems. I knew when troubleshooting later that “it's a bad coil” would never be the cause of whatever problem I might be having. 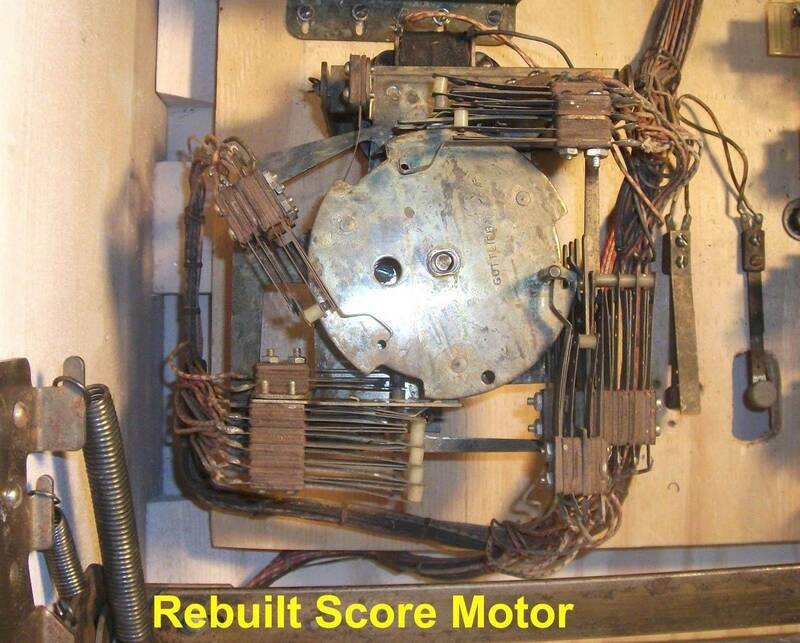 The score motor was also a bit of a mess. There were a number of disconnected wires. One switch was missing a contact. The grease in the gearbox was preventing the motor from turning smoothly. The frame was rusty. 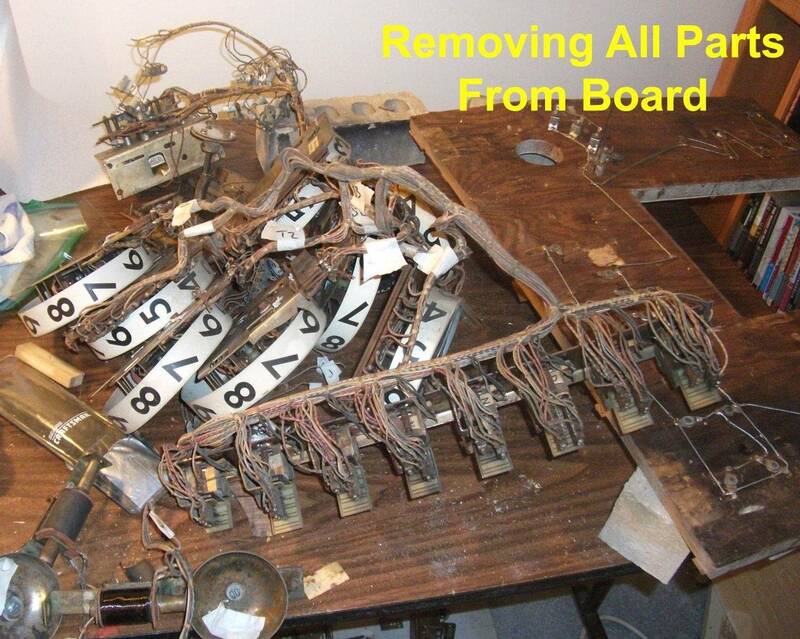 I took the score motor apart completely and removed all 32 of the switches. I took lots of pictures and ran nylon ties through the holes in the switch stacks. I labeled everything in a way that made sense to me and soaked everything, screws and all, in Evapo-Rust. 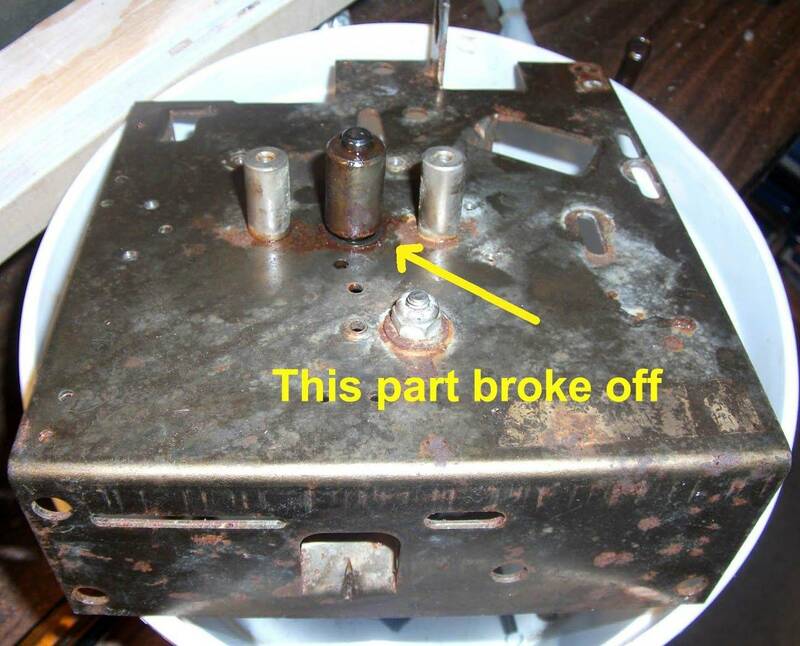 A few screws broke while coming out; that happens when everything is rusted solid. 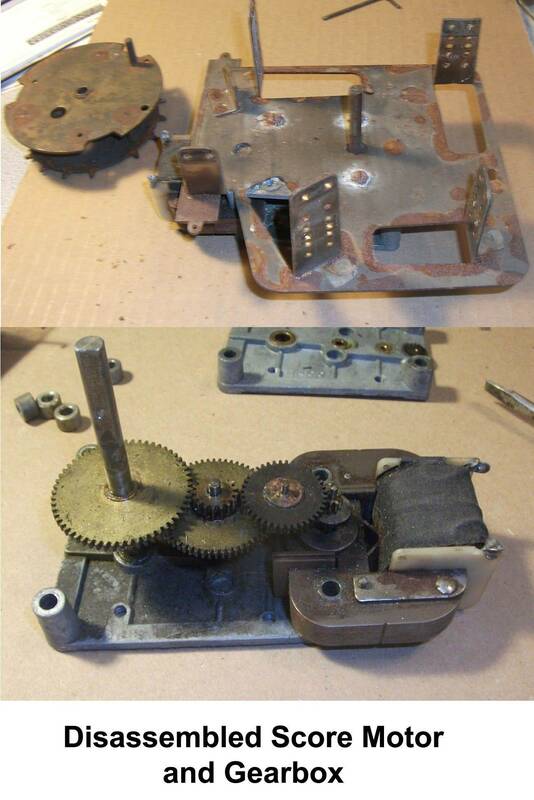 I also had to disassemble the gearbox for the score motor, which required drilling out rivets. These things weren't meant to be taken apart. I managed to get it back together with a minimum of drama and only had to reassemble it twice to get it to work. I spent about a month getting everything disassembled, de-rerusted, cleaned and reassembled. Then I ordered a bunch of springs and coils from Pinball Resource and put it all together. As I had good access to all of the switches and relays, I thought I'd go ahead and adjust them at this point, thinking that it would spare me the hassle of trying to adjust them later when I put the board back in the cabinet. Didn't work out that way; there was still plenty of adjusting to do. At this point, I had a new, clean, nice-smelling piece of lumber and some surprisingly clean and shiny motor and relay brackets. I also had new coils, new springs, and a bunch of freshly resoldered wires. At this point, I also replaced the power cord with a proper, grounded, 3 conductor cord. 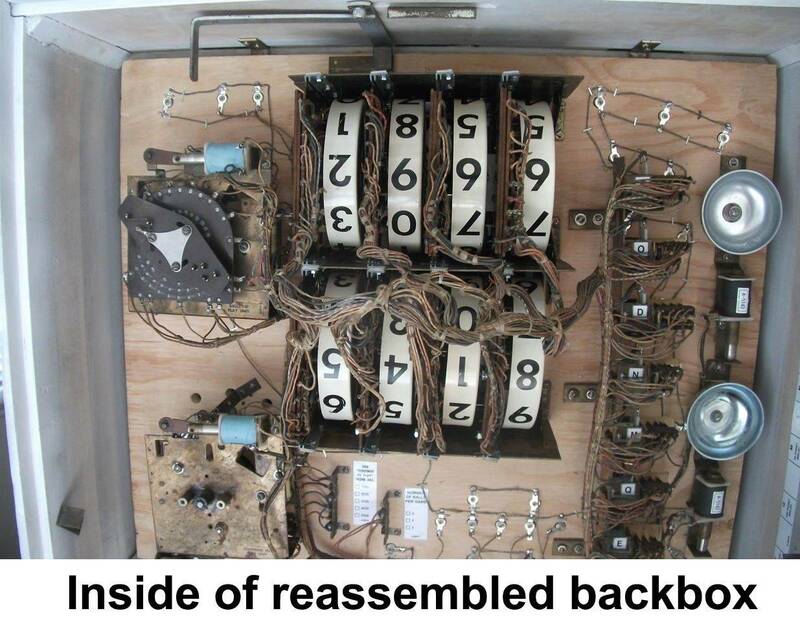 When I was done with that, I sat the rebuilt score motor board on the floor under another pinball machine and went to work on the other remaining catastrophe – the backbox. And yes, I did eventually get rid of that light switch. Now I understand better why you replaced ALL the coils - yuk! Same story with the light sockets. Some were good, many were rusted, some were corroded to the point of uselessness. And since I was taking all of the relays, score reels and pop bumpers apart, it made sense to replace all of the springs, too. While the backbox was a mess, I was grateful that it didn't have any dead animals in it. That part was behind me. 1. Originally, everything inside was mounted to a piece of plywood that had a piece of shaped MDF attached to it. The MDF was there to guide the lights from the bulbs behind the glass so that they illuminated only the parts of the glass they were intended to illuminate. 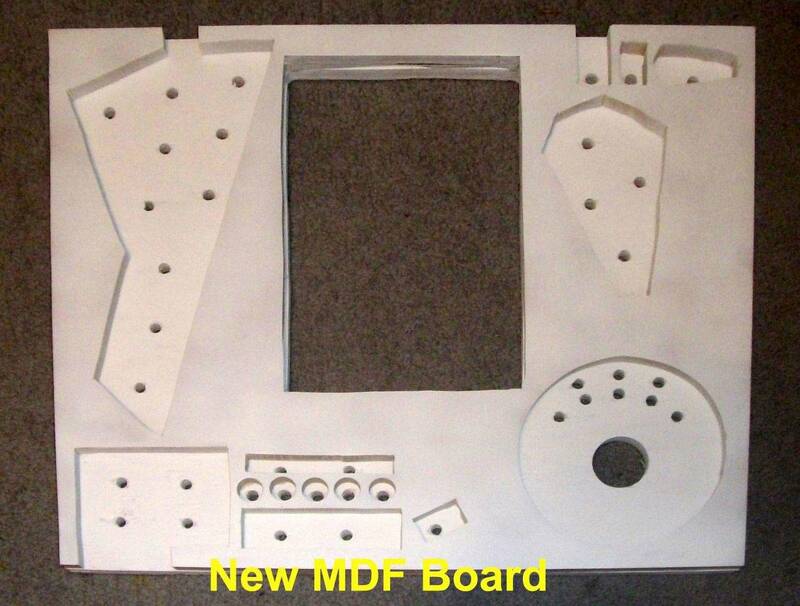 Unfortunately, the MDF on this machine had turned to dust, and literally fell out in a pile on the floor when I began to take the machine apart. 2. The plywood to which the now-missing MDF was attached was badly warped. 3. The large metal bracket to which the score reels were attached was rusty. 4. The nylon guides that hold the score reels in place had disintegrated, so the reels were all just hanging by their wires. 5. The metal bracket for the 8 relays in the head was rusty, as were all of the armatures. 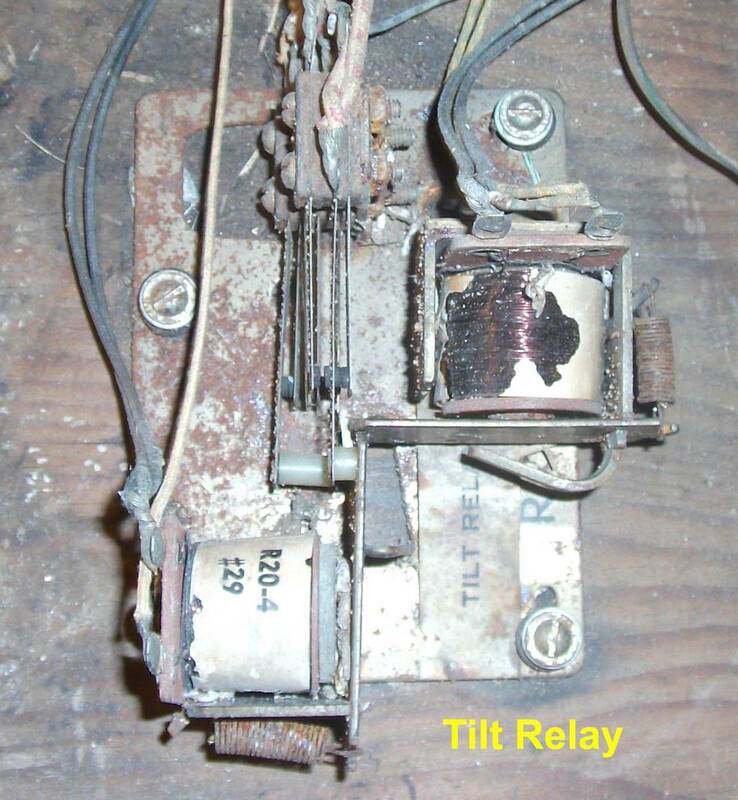 Several relays had disconnected wires. 6. Three of the 8 score reels had base plates that were rusted badly enough that they'd need attention. 7. This game has two ball count units – one to count balls in play (Balls to Play unit) and one to count extra balls earned (Continues to Play unit, aka the “beach ball” unit.) The Continues to Play unit was rusted so badly that there wasn't a single part on it that would move. 8. All of the light sockets were corroded; some so badly that I couldn't get the bulbs out. 9. The two bells had issues, as they were rusty and the mounting holes had enlarged with time. 10. The back door was badly rusted. I removed everything from the board, which made for an interesting mess. Then I cut a new piece of plywood and used the old one as a guide to cut and/or drill holes. Then, with the help of Matt Model237, I got some photos showing me what that missing piece of MDF was supposed to look like. I didn't own a jigsaw, but I own one now, and I bought a piece of 3/4” thick MDF and did my best to cut it to shape. 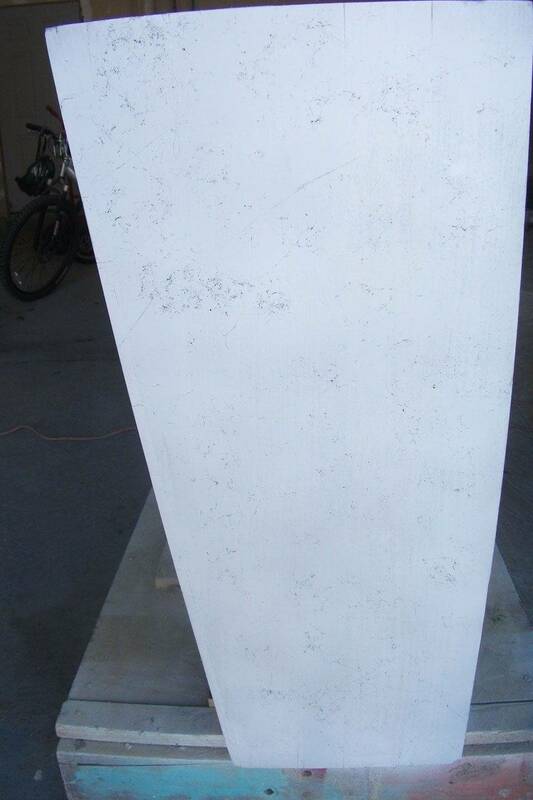 Then I painted it white and attached it to the piece of plywood. I soaked the score reel mounting bracket in Evapo-Rust and went about trying to find a suitable replacement for the missing nylon score reel guides, as no one seems to have reproduced those. I got the rust off of the bracket, attached it to the board and added the new plastic guides. While everything else was off of the board, I took the opportunity to replace all of the light sockets. It's a pretty easy job when nothing else is there to get in the way. As for the score reels, I had to disassemble all 8 of them. Three of them were so badly rusted that I had to strip them down to the base plate so I could soak them in rust remover. For that, I had to drill out the three rivets that held the bakelite mount for the wires and label all of the wires so I could keep track of what was what. I reassembled them by using screws where the rivets had been. The other five reels were in acceptable condition, so I just disassembled them and cleaned all of the parts with Novus #2. I bought replacement spring kits from Pinball Resource and a new coil for each of the 8 score reels. The reels themselves were in acceptable condition, so I just cleaned them with Novus and put them back in place. For the relay bracket, I disassembled all 8 relays and put nylon ties through the holes in the switch stacks to keep them together. Then I threw the bracket, the 8 armatures and all of the screws in my Evapo-Rust bucket overnight. I reassembled the relays with new springs and a new coil for each. I took both bell mechanisms apart and soaked them in rust remover, and replaced both bell shells with new ones, along with the coils. I took both ball count units apart, soaked them in rust remover and replaced all of the springs and coils. 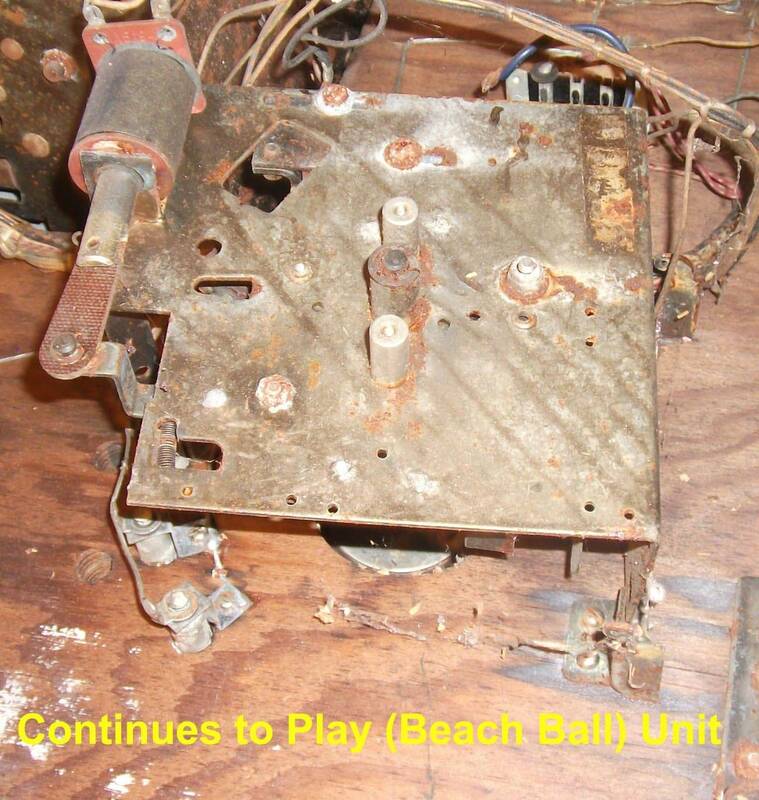 The beach ball counter was particularly problematic because it had rusted to the point where nothing would move and the main shaft wouldn't rotate. I used penetrating oil to try to loosen it, but when I tried to work the shaft out, a bushing that was attached to the base plate worked loose. My brother Scott scottiedot has a machine shop, I sent that unit to Texas for a few weeks so he could reattach that. Once I got it back, it went back together without issue. 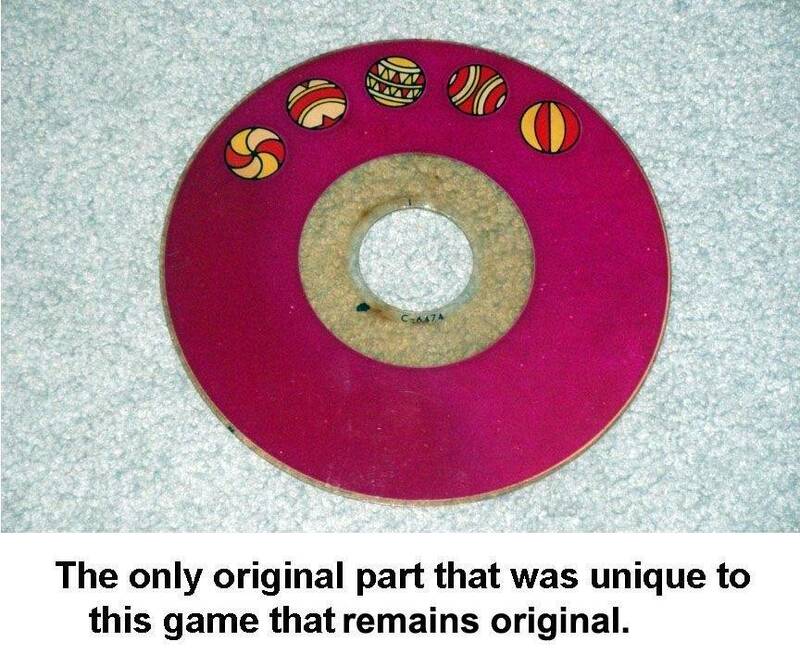 The purple plastic disc that counts beach balls was in surprisingly good condition. In fact, it's the only part on this game that was unique to this game that's still a part of it. At this point, I had a new playfield, plastics and apron, a reassembled/repainted cabinet, a new backglass, and a rebuilt backbox. The next part of the project was dealing with remaining issues on the playfield. Great work on restoring this so far. I probably would have given up at the dead body. Thanks. Still have to document playfield reassembly and getting it to work. I also need to take a few more photos. I hope to have the remainder posted by this weekend. Keep the pics coming!! I am always inspired by these threads. I also think it's great that you salvaged what would have most certainly been junked by most anyone else. I'll provide a few more before I'm done. Part of the problem here is that I didn't have a restoration thread in mind when I was doing the work. So I have a lot of "before" photos and a lot of "after" photos, but not a lot of "in progress" photos, such as photos of the process of silkscreening the apron or the process of assembling the backglass. I'll try to get the remainder of this posted tomorrow. After 14 months of tedious Photoshop work on the backglass and playfield, messy work with opossum remnants and hundreds of rusty parts, I finally got to the part that might be considered to be “fun” - reassembling the game. Pinball Resource probably got $1000 out of me on this project, and a lot of it went into the playfield. I did have to soak the brackets and other parts for the relays that were mounted under the playfield in rust remover, but that was a relatively minor project. 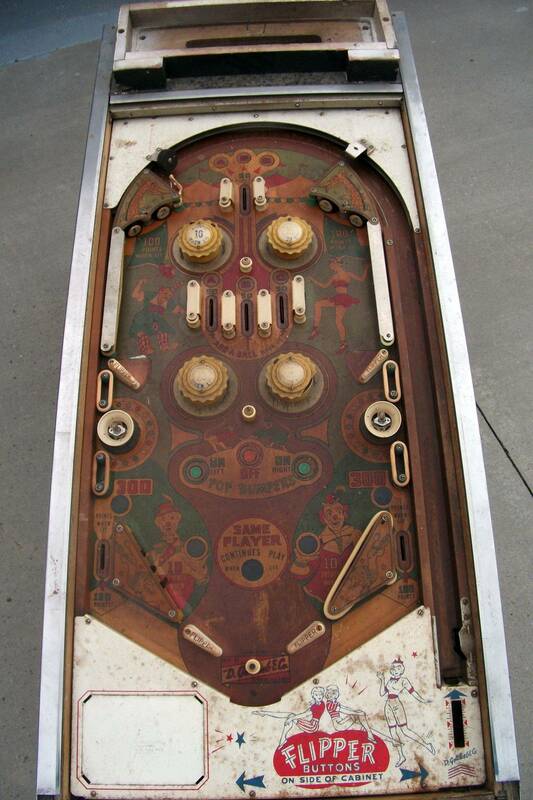 For the most part, the underside of the playfield was surprisingly clean, especially given how bad the top side had been. Replace all of the light sockets and install bulbs and colored lamp sleeves where appropriate. Replace all of the coils on relays, slingshots, pop bumpers, flippers and the ball trough. Rebuild pop bumpers with new caps, bodies, skirts, springs and sockets. Rebuild flippers with new flippers and one new shoe. Replace rebound rubber, ball arch gate, and a few other metal parts. I kept all of the existing plastic posts, as they were all marbled plastic and I can't find suitable new replacements. I threw them in an ultrasonic cleaner to clean them up and on a few I had to scrape old bits of rubber off with a knife. I also needed to clean up the ball lift rod and shooter rod, as the ball lift rod is no longer available as a new part and the shooter rod in this game is a non-standard size. Both of those rods were badly rusted; I fixed that by sticking them in a drill press and buffing them with #80, #200, #400, #600, #800, and #1000 grit sandpaper. They came out nice and shiny, and almost look as good as new. With a new beehive housing, that part was all set. 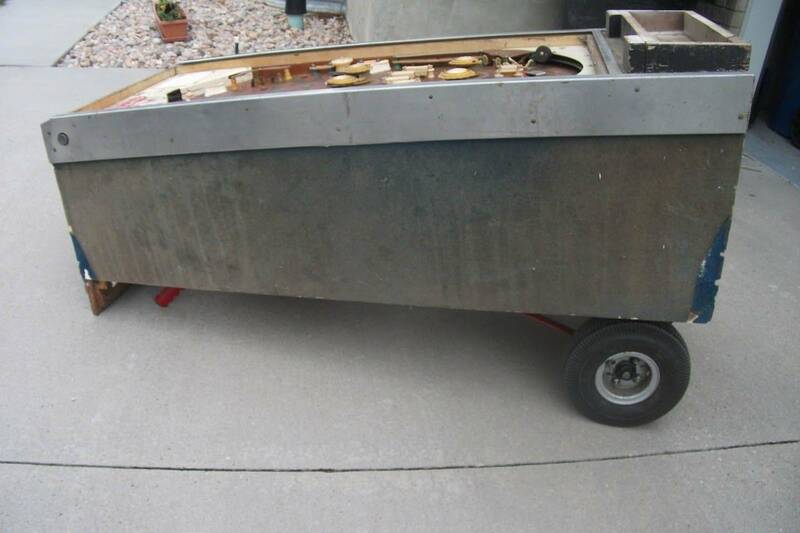 I outsourced one part of this project – I handed the lockdown bar off to a metal shop. They polished the steel bar and replated the two pot metal end caps, as they were missing all of their plating. Assembly was pretty straightforward on this; I turned the playfield upside down and replaced all the coils and sockets at one time. Valuable lesson that I didn't learn until later: When replacing lamp sockets, buff them with sandpaper before soldering (or use flux.) Otherwise, solder tends not to stick very well. This came back to haunt me when I was trying to get the game to work. 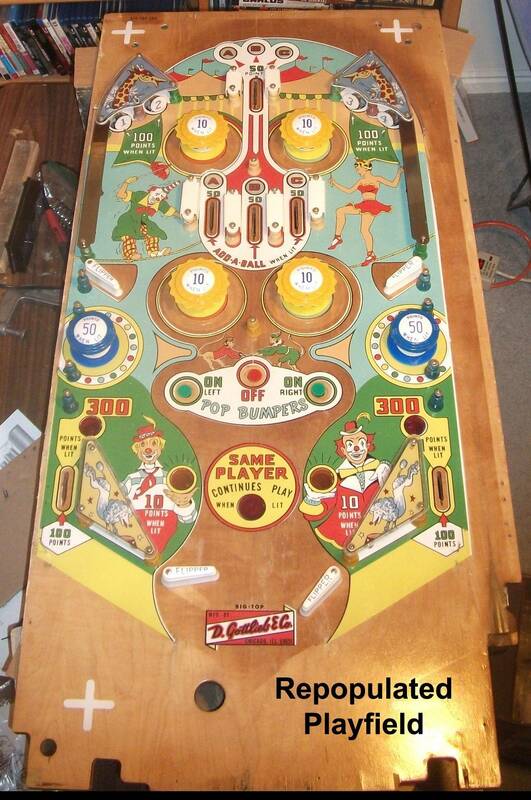 After that, I flipped the playfield back over and repopulated it with new flippers, pop bumpers, and plastics. I replaced the four numbered targets and silkscreened some new ones. I had also repainted and rewebbed the ball arch at some point. The webbing came out a bit heavier than I'd have liked, but it looks OK. I'm not a fan of LED lighting for any game that didn't ship with it, but I did install LED lamps under the ball arch, as those bulbs are a nuisance to replace. As those lamps are covered with colored sleeves, they don't draw attention to themselves. I also installed LEDs behind the beach ball disc in the backbox, as those bulbs are really difficult to replace. Every other socket in the game got a new #47 incandescent bulb. Once done with all of the above, I screwed down the newly screened apron, installed a newly-printed instruction/score card and called the playfield done. 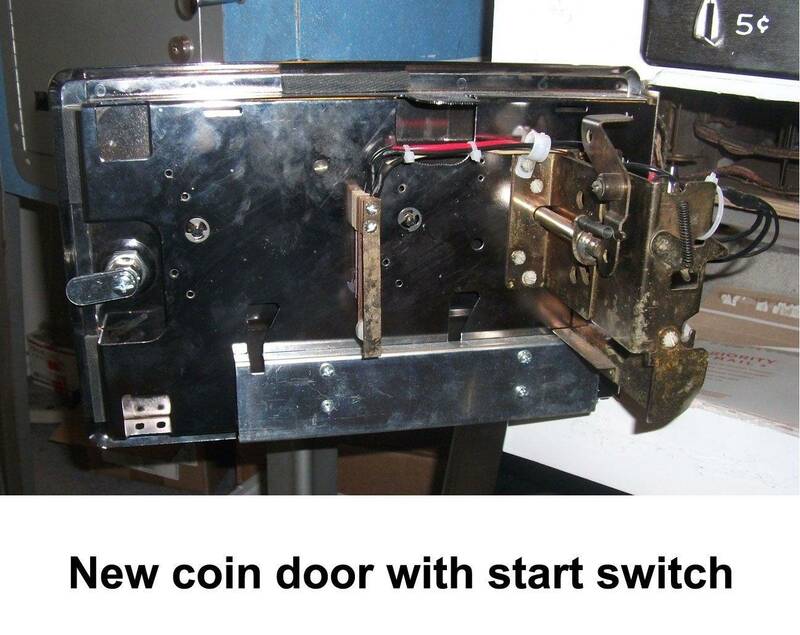 The original coin door and coin entry plate were badly rusted, and the cost of replating them exceeded the cost of replacing them with new ones. I did that, and interestingly enough, the coin door was the single most expensive part I bought in restoring the game. I also bought some new legs, as the original set was in such bad shape that I opted to leave them in Texas. Add-a-ball games don't have start buttons; you start a game by inserting a coin (or two, in the case of a two player game.) Most people find some way to rig up a way to start the game without a coin. In the case of Possum, a previous owner used a light switch. That's a poor choice, as the wires were exposed and they carry 110 volts. 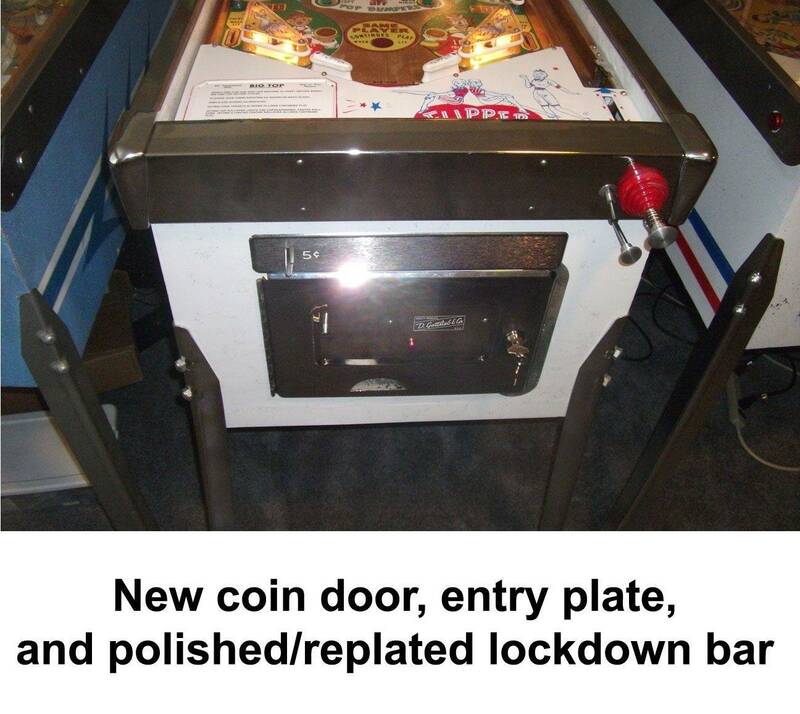 Gottlieb used two different coin doors in this era; the ones for replay games had an additional hole for a start button that the doors used for add-a-ball games did not. Replacement doors only come one way – drilled for a start button. Given that the hole was already there, I decided to put a start button on the game. For about $5, I was able to add a button and buy the parts I needed to build the switch, which I simply tied to the coin switch. Prior to this, I did what a lot of people had done and adjusted the coin reject rod so that it would press the coin switch. By the time I was done, I had it set up so that either would work. The only other modification I made to the game was to add a standard-issue power switch, which I located in the same place anybody would ordinarily expect to find one. I figured (correctly, it turns out) that I'd be turning that game on and off a lot in coming weeks, and having an easy way to do it might be helpful. 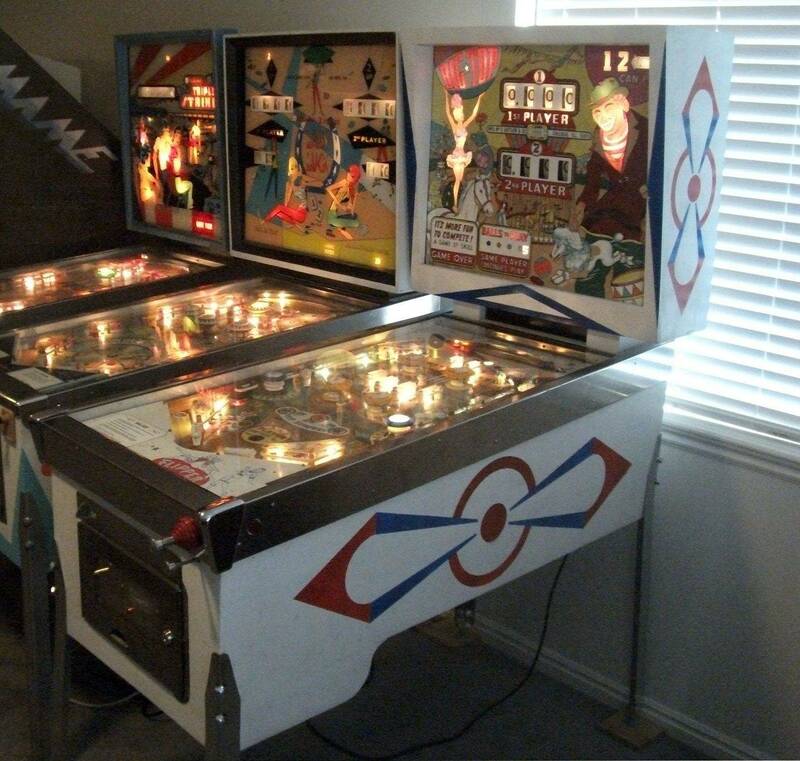 I installed the playfield and a new ball and I was ready to see if I could play some pinball. At this point, some 15 months in, I figured I was in good shape. Everything was reassembled and the game was ready to plug into the wall. I'd had everything apart to a degree that had often left me uncomfortable, but by ressembling every relay, replacing every coil and spring, and addressing every switch in the machine, one at a time, I figured that I had all of the game's switches pretty well adjusted and that by the time I plugged the game into the wall, it wouldn't take much to get it working. Troubleshooting electromechanical gremlins isn't my strong suit, but I figured I probably wouldn't have much to fix once I plugged it in. I love the work and I love the storytelling. Thank you for sharing. ...nothing happened. No lights; no game. A couple of anti-cheat switches that appeared to be closed were not making contact. That was the first of many problems I encountered in trying to get the game working. Did I have every switch adjusted correctly? Of course not. I also encountered a dozen more broken solder joints, including a few that I'd recently soldered. Misadjusted switch on balls to play counter. Misadjusted switch on DB relay causing extra ball counter to increment and decrement at the same time. That doesn't work, by the way. Multiple misadjusted switches on SB relay preventing the game from resetting. Wouldn't complete startup sequence because a normally open switch on the score motor was arcing. Two player game wouldn't start – One player game would start but two player game would just cause the score motor to run. Pop bumpers would lock up if you hit any of them. 100 point relay sticks when scoring 100 points. None of the player one score reels would carry over correctly. Once I fixed that, none of them would carry over correctly on the first ball, but they'd do it on balls 2-5. Multiple playfield lights wouldn't work. Extra ball light on playfield wouldn't work when earning an extra ball. Scoring 10 points was advancing the 100 reel due to residual magnetism on the H relay. 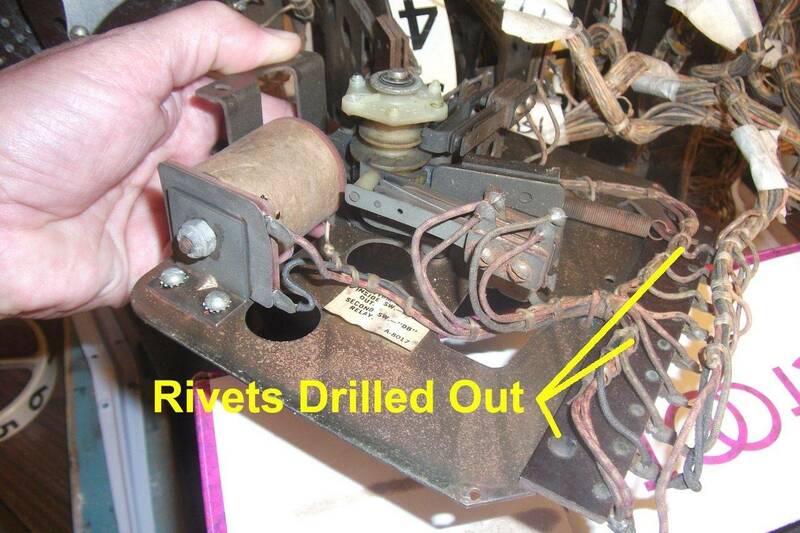 Broken switch on C rollover preventing scoring or awarding an extra ball. Broken solder connection on x relay causing score motor to run. 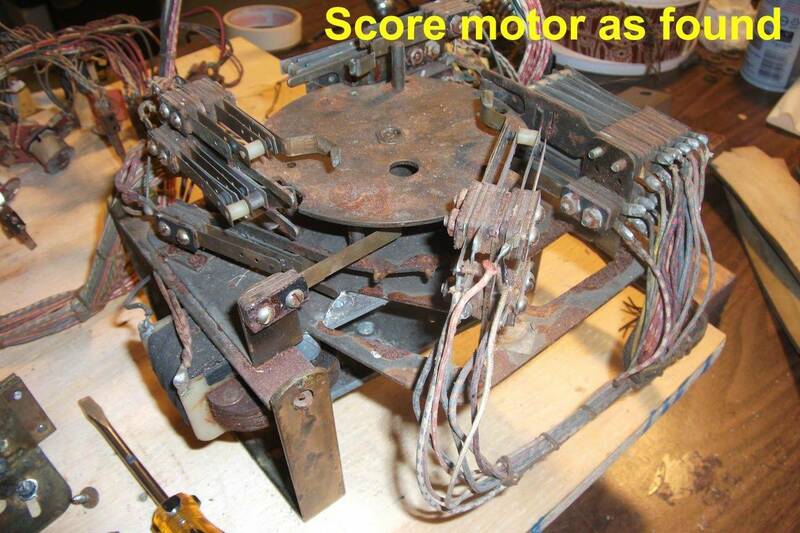 Broken solder joint on score motor preventing game reset. Beach ball counter correctly incrementing, but not decrementing, and player not getting to play their extra ball. 300 point outlane only scoring 100 points. Awarding extra ball correctly at 2000 points but not at 5000 points as it should. A, B, and C rollover lights not working. Game randomly switching scoring from player one to player two in a single player game. Game awarding two extra balls at a time instead of one. Game awarding 1 1/2 extra balls at a time instead of one. C rollover awarding extra balls intermittently. I ended up opening several threads here to solve specific problems and sometimes, solving one problem fixed another one. Matt model237 was a big help, too, as he was trying to get his game working about the same time. I devoted an entire afternoon to reading articles about Gottlieb schematics and score motors. That was a big help. Another big help was taking the time to label all of the relays. They were all labeled at the factory, but by the time I got the game only two or three of the two dozen or so relays in the game were labeled. It's hard to fix a problem when the schematic tells you to look at the “E” relay and you have no idea which one that might be. Fortunately, the Alamo Games site had photos of most of the relays and theirs had labels. Matt was able to fill me in on the others. 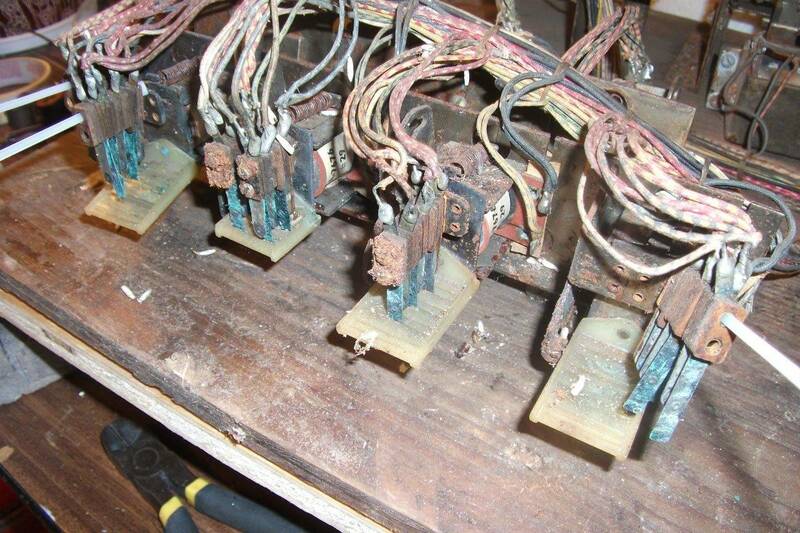 A few of the relays had residual magnetism problems, which caused them to stay closed even after the power was removed. It ended up taking a couple of months to get everything ironed out, and by the time I was done and ready to declare Possum to be a working machine, I'd spent 20 months on it and had given it probably 500 hours of my time. I also ended up spending $2413.46 on the game, which, adjusted for inflation, is about what the game sold for when new. 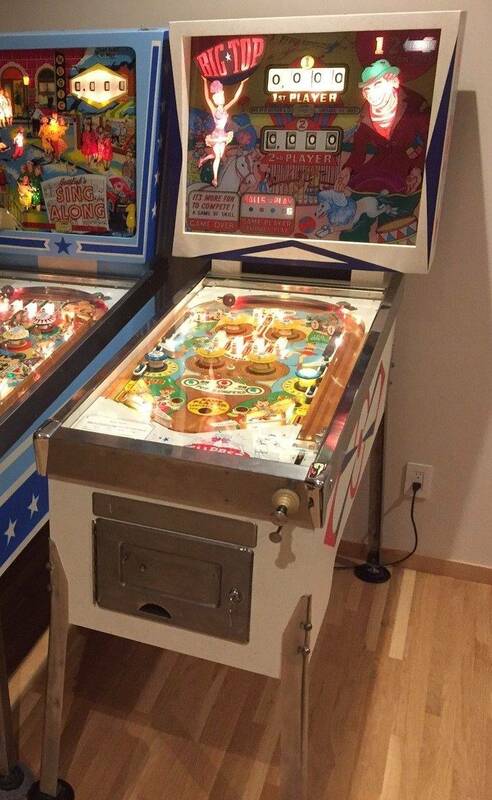 That's appropriate, as the game now looks and plays like a brand new 1964 pinball machine. It came out looking great, and it's fast and responsive. Replacing all of the coils, springs, lights and playfield parts helped a lot in that regard. I also learned a lot about troubleshooting on this project. I've owned games for decades, but I've never had to work on a game to this degree. Since I've finished this game, I've been motivated to track down and fix every single nagging problem on my other games, no matter how minor. I've also helped my brother get 3-4 of his games working. I'm glad I did this, but I can't say I'd be interested in doing it again. I like buying project games, as they're cheaper than restored ones and give me something interesting to do, but I'm going to make sure that the next game I buy has a good playfield. That's one part of this restoration that I'd rather not do again. I'd also like to stay away from games with dead marsupials, but I think that's pretty obvious. Oh, one other thing – Big Top really is a fun game and it's reputation for being a good player is well deserved. You can earn up to 5 extra balls at a time, and you earn them via score, A-B-C rollovers, or hitting the 1-2-3-4 targets in sequence. ...the A-B-C rollovers and the 1-2-3-4 targets do not reset after a ball, in between players, or in between games. That means that in a two player game, you can get the 1-2-3 targets and then lose your ball and the other player can hit the 4 target only and get that extra ball instead. I've played games where I've earned 10-12 extra balls. Gottlieb did a great job of making sure you got a lot of play for your money. Possum was definitely worth saving from the landfill. Thanks to Matt model237, howardR, and Rolf Martin rolf_martin_062, as they were all a big help in getting this thing to work. And thanks to all for the kind comments about my restoration work. Amen!! I really enjoyed the write up of this restoration. You sir, will most certainty be the recipient of good pinball karma one day. Not too may folks would have taken on such a monumental task. ...that has got to be one of the NASTIEST starting points...and look at the beauty you have now. Impressive!! and look at the beauty you have now. Impressive!! Generations, it should be this one! Wow! This is an awesome thread. Great work. Truly inspirational. Big Top is indeed a fun game. I'm glad to have one in my small collection. Amazing time and money you put in, too. I understand it though. There's something special about bringing a hopeless old neglected pin back from the dead. Thanks, Matt. Did you ever get that 1.5 beach ball issue fixed? Thanks. On these train wreck restorations, the biggest part of the effort is sometimes just a matter of talking yourself into doing it. I think the lesson here is that as long as the machine isn't missing critical parts, any game can be restored, though not all are worth the effort. That said, I hope not to have to do something of this magnitude again. It was sort of a "proof of concept" project. "Hmmm. Can that be done?" Now that I know that it can, I'm not that eager to try it a second time. One opossum is enough. The biggest takeaway from my point of view is the experience you gained in the process. On the bell curve of average as found game condition, Possum was an extreme outlier. Any game that crosses your path now will be easy assuming its condition falls in the main area of the condition bell curve. Nasty. Whomever took that one on has my sympathy. On the plus side, Slick Chick is a game that's well worth any amount of effort to fix it. That's great playfield touchup work, too. My Slick Chick was in pretty rough shape when I bought it ten years ago, as it had been stored in a humid barn in Louisiana for decades. 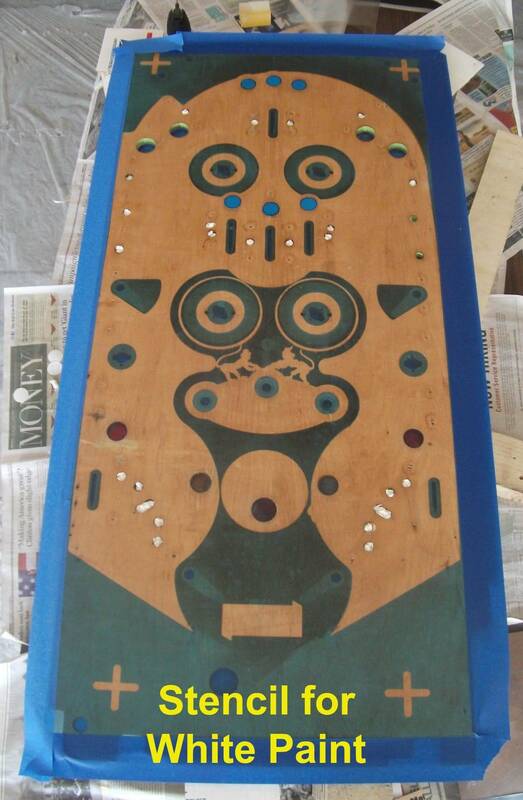 Fortunately, my playfield didn't require quite that much touchup, and most of my problems were near the top, where they're less visible. As with Possum, I ended up replacing all of the light sockets and either de-rusting, replacing, or replating every piece of metal on it due to rust issues. Mine had no animals in it, though. That's always a plus. 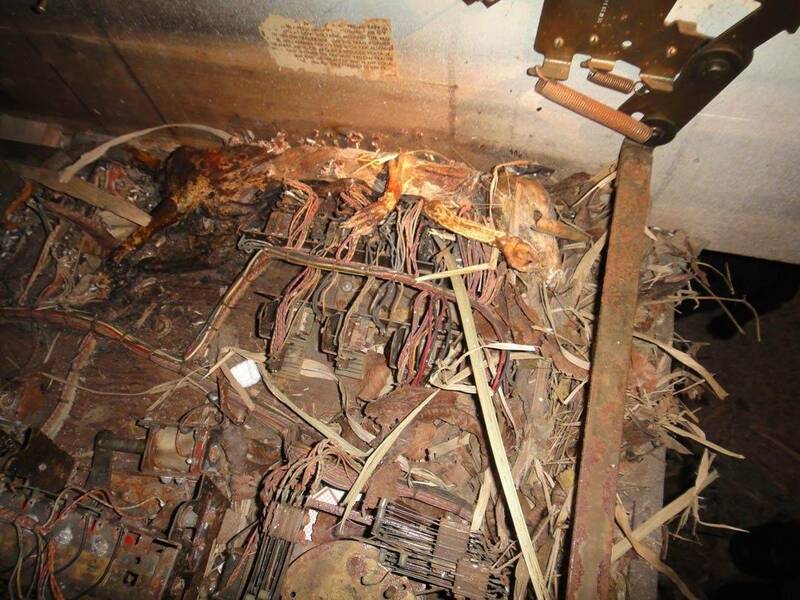 I have no idea why animals find the interior of pinball machines so appealing.